The previous chapter may be found here. Seven million years ago, the western side of the broad river valley between the Sierra Nacimiento and the Sangre de Cristo Mountains had become a cluster of volcanic mountains. 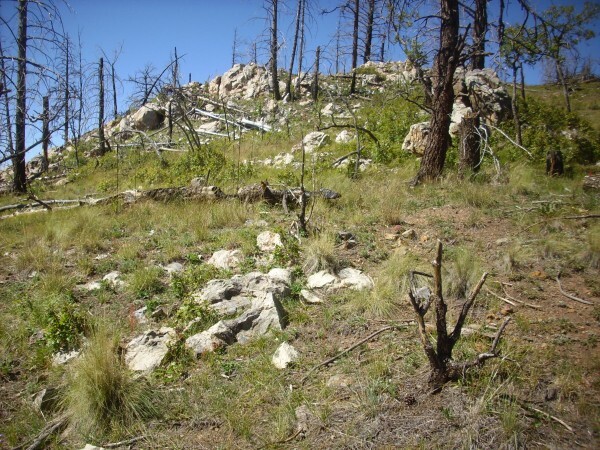 The great pulse of eruptions responsible for building the Jemez volcanic pile had peaked a few hundred thousand years earlier, but activity had not entirely ceased, and increasingly silica-rich magma still occasionally rose to the surface. Meanwhile, erosion had begun to wear down the volcanoes, creating an apron of debris extending all around the mountains but particularly to the south. Mastodons, camels, primitive horses, and beavers were among the animals living in the moister river bottoms or among the pine forests of the higher elevations, but the ancestors of humans had only just diverged from the chimpanzees and begun a bipedal existence. Sahelanthropus tchadensis may represent the first human ancestor not shared by the other great apes. With North America distant from humanity's birthplace in Africa, and connected to the Old World by a narrow, intermittent land bridge, it would be nearly another seven million years before humans arrived in North America. Renewed extension of the Rio Grande Rift would shortly open new fractures through part of the volcanic field, resulting in voluminous high-silica eruptions that would produce distinctive beds of tuff and add to the growing debris apron around the Jemez. In this chapter, we will look at the formation of vast beds of volcanic sediments accompanying early volcanism in the Jemez volcanic field towards the end of the Tertiary Period. Gravity is a relentless leveling force, and, over geological time spans, it can bring down the highest mountain. This is particularly true where the climate favors erosion and the rocks underlying the mountain are soft or otherwise easily decomposed. 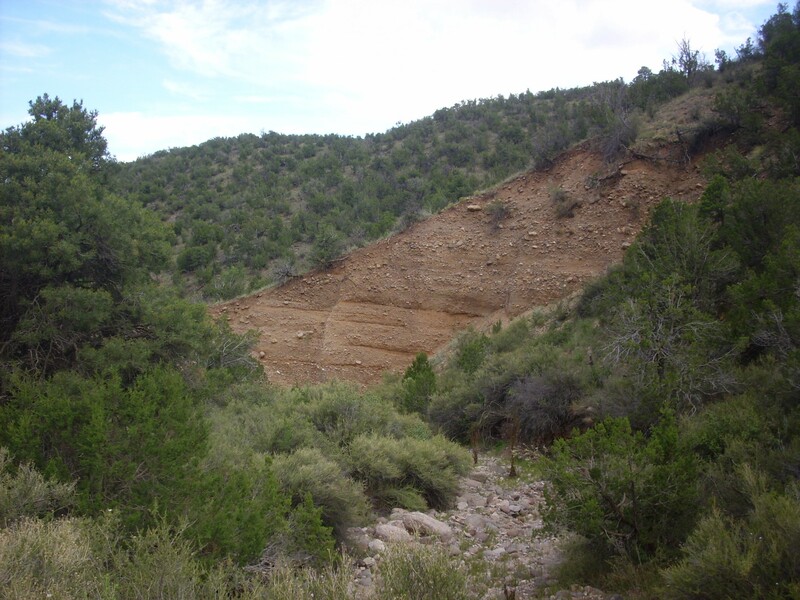 The eroded sediments can produce widespread and thick beds, as they do in places in the Jemez. In addition, volcanoes tend to eject a lot of solid particles into the air during eruptions. These, too, must come down somewhere, and they form a variety of rock types described as pyroclastics. Pyroclastic rocks lie somewhere in the borderlands between igneous rocks and sedimentary rocks. As the products of volcanic activity, they seem like they would be igneous rocks; but as rocks formed from deposits of broken rock fragments, they seem like fair game to be claimed as sedimentary rocks. Early geologists had some difficulty deciding how to classify them, particularly since it was uncertain exactly how various kinds of pyroclastic rocks formed. Those composed of microscopic clasts cemented together were lumped together as tuffs. With further observation of active volcanism and study of prehistoric pyroclastic rocks, geologists came to understand that pyroclastics formed by more than one process, and that some were clearly igneous rocks while others were clearly sedimentary. Pyroclastic rocks whose clasts were cemented by their own residual heat, or by components of the hot gases that were erupted with the clasts, were clearly igneous and became known as ignimbrites. Those that had been reworked by wind or water became known as volcaniclastics, and are usually regarded as sedimentary. Tuffs turned out to include rocks from both groups. There are also cinder and pumice beds, which when fresh and poorly consolidated are usually considered igneous but become sedimentary when they are cemented by ground water, and maar deposits, which are right on the border between igneous and sedimentary rocks and are probably best regarded as sui generis, in a class of their own. 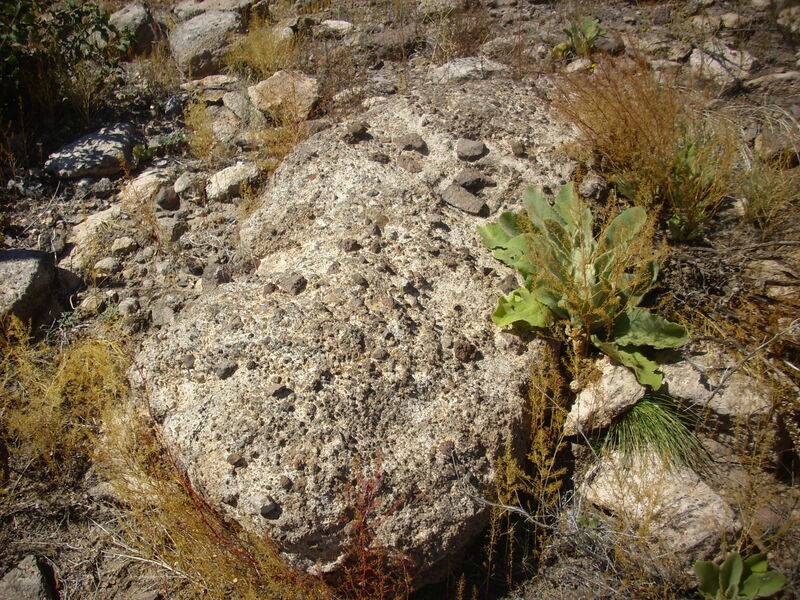 Examples of all these pyroclastic rocks are found in the Jemez area. Most magma contains considerable dissolved gas, mainly water vapor and carbon dioxide. The gas remains dissolved in the magma so long as the magma remains deep underground and under pressure from the weight of the overlying country rock. However, when the magma approaches the surface and the pressure begins to drop, the gases begin bubbling out of the magma. In a low-silica magma, gas molecules move easily through the magma to join existing gas bubbles, instead of forming new gas bubbles. As a result, the bubbles are few and large. When the magma reaches the surface, these large bubbles burst relatively gently. The lava may fountain to a considerable height, but the individual blobs of lava are fairly large and fall to the surface close to the vent. Now free of gas, the lava can pool to form flows. This is the kind of eruption that tourists in Hawaii view from fairly close up in reasonable safety. In a high-silica magma, gas molecules have great difficulty diffusing to existing bubbles and tend to form new bubbles instead. The magma becomes a foam of microscopic bubbles. At the same time, the magma is rapidly solidifying. The solidification is so fast that crystals do not have time to form, and the magma solidifies into volcanic glass instead. 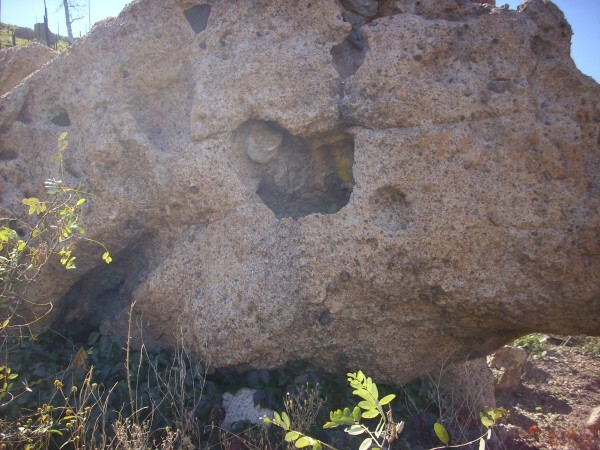 If the glass forming the walls of the bubbles is not strong enough to withstand the pressure of the gas within, the rock disintegrates into fine dust as the bubbles shatter. The final product is a hot mixture of volcanic gases in which is suspended countless tiny shards of volcanic glass. These shards continue to emit residual gas for some time, and this helps keep the shards suspended in the mixture. Clasts formed from degassing magma are collectively known as tephra, regardless of size. The finest clasts, under 2mm in diameter, are classified as ash. Those between 2mm and 64 mm (2.5 inches) in diameter are known as lapilli, while larger tephra are classified as either volcanic bombs or volcanic blocks, depending on whether they are still partially molten when they reach the surface (bombs) or are already largely solidified (blocks). The mixture of magma, tephra, fragments of country rock, and hot gases accelerates rapidly as it approaches the surface, sometimes reaching velocities of over 600 m/s (2000 feet per second) by the time it leaves the vent. This is roughly twice the speed of sound. This jet of material is known as an eruptive column. What happens thereafter is determined by whether the eruptive column mixes with enough of the surrounding air to become less dense than the atmosphere. If enough air is entrained to make the eruptive column less dense than the atmosphere, then buoyant forces will cause the eruptive column to continue rising, often to more than 30km (20 miles). This is well into the stratosphere. Such an eruptive column is called a convective eruptive column or a plume. Once the column reaches an altitude where its density is equal to the surrounding air, it slows rapidly and begins to spread out to form an umbrella or mushroom cloud. As the eruption column expands and cools, the ash begins to fall back to the earth. The coarsest clasts will tend to fall out close to the vent, while finer ash may be deposited a considerable distance downwind. Ash from the Jemez area has been identified as far as 500 km (300 miles) downwind. The very finest ash particles that reach the stratosphere may remain there for years. Ash fall beds have a number of distinctive characteristics. They tend to form an even blanket of uniform thickness over the existing terrain, and the clasts are typically well-sorted. The ash is typically white to grey in color, which often makes an ash bed stand out in a sequence of sedimentary beds. 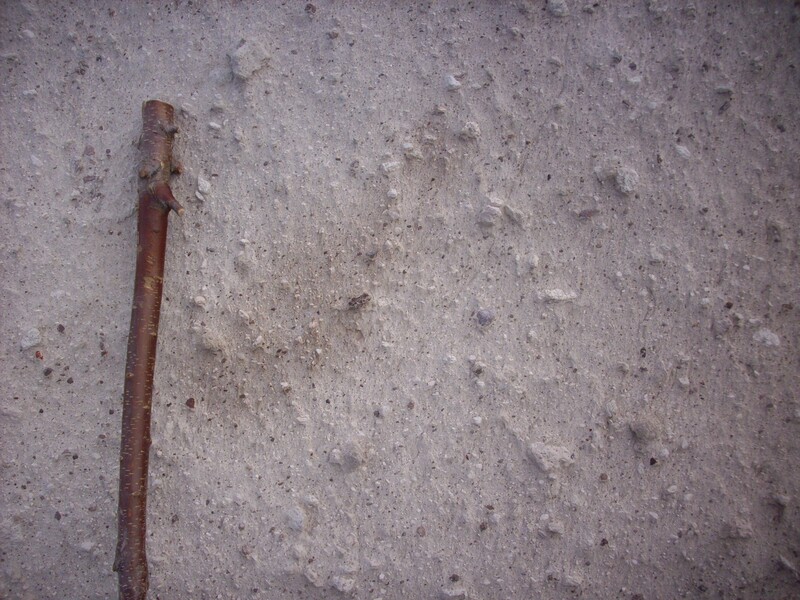 Because the ash is already quite cool when it is deposited, fresh ash beds are unconsolidated. However, because the ash is rich in colloidal silica, it will rapidly become cemented if it moistened by rain or groundwater, and so ash beds are often well preserved in the geological record. 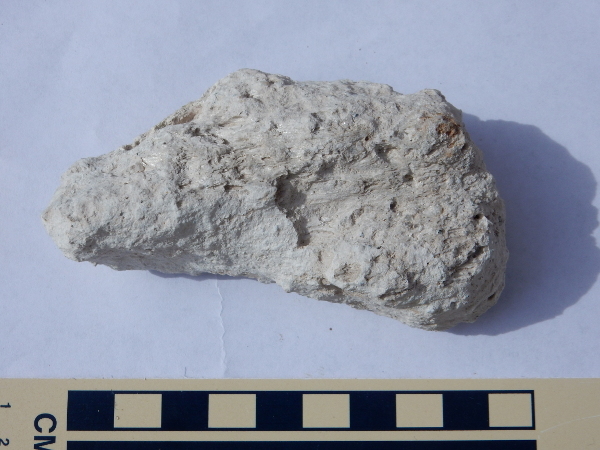 The sample is about 10 cm (4 inches) long and so is classified as a volcanic block rather than a lapillus. Under close examination, we find that many of the voids are elongated along the length of the sample, suggesting the pumice was stretched while still partially molten. This is quite common. Under the loupe, the pumice shows a few phenocrysts of quartz and feldspar, some tiny fragments of mafic rock, and even a few bits of older pumice entrained in the younger rock. 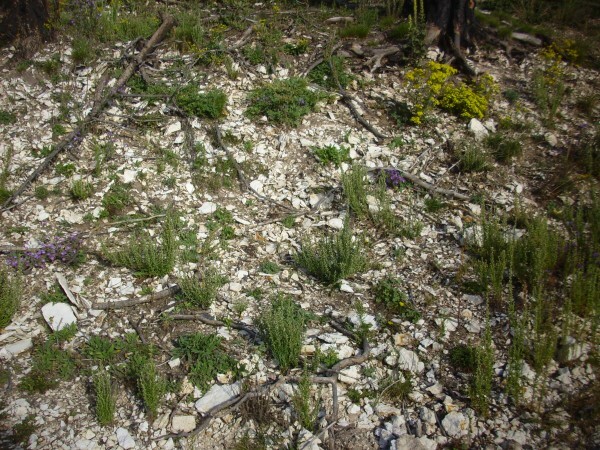 Like ash fall beds, pumice fall beds are fairly uniform in thickness and tend to be well-sorted, and they are unconsolidated when fresh but can become well-consolidated after they absorb water. Pumice and ash falls beds that have become indurated in this manner should probably be regarded as sedimentary rocks, since they have undergone a form of diagenesis (alteration by groundwater after deposition). 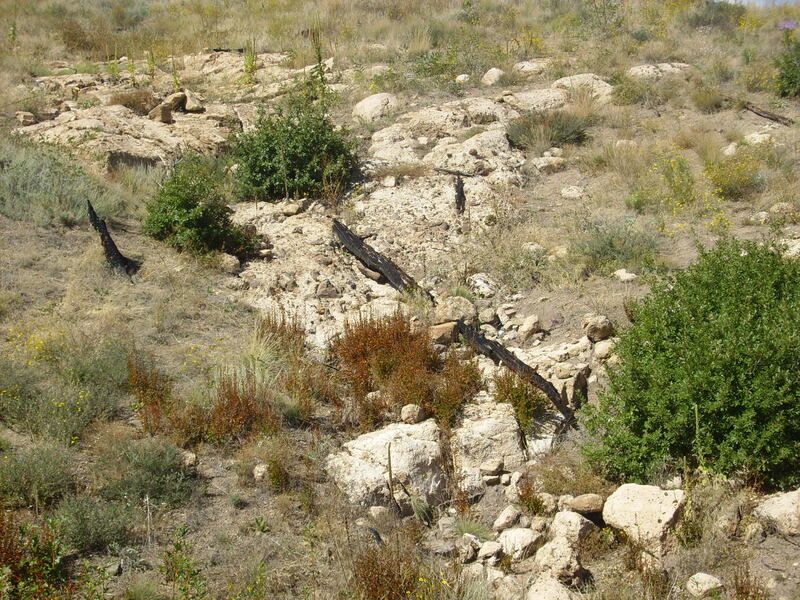 Indurated ash beds are one of the rock types that earlier geologists identified as tuff. 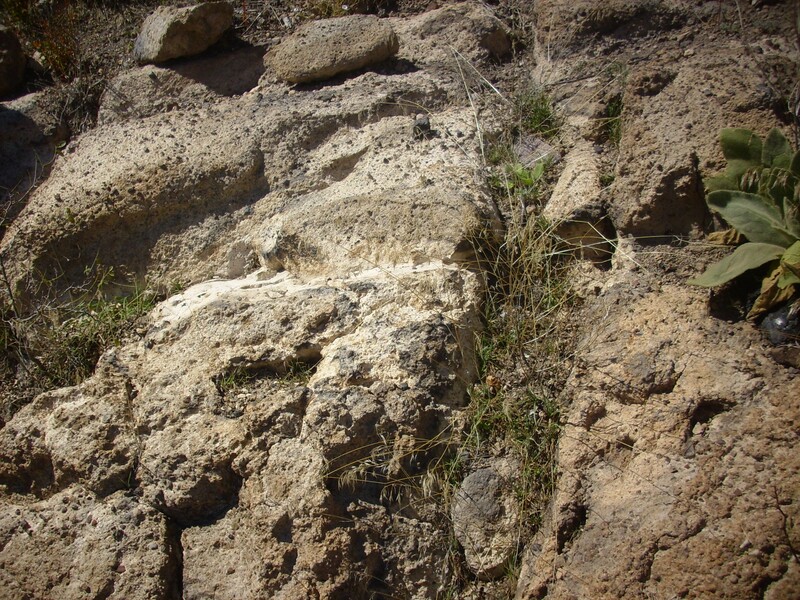 Ignimbrites are formed from volcanic ash deposited in a pyroclastic flow. These form when an eruption column does not entrain enough air to become less dense than the surrounding atmosphere. The result is column collapse. The hot mixture of gas and particles falls back to the surface and flows along the ground, often for distances of many kilometers. Because the mixture is heavier than air, it tends to pool in low areas. The clasts in the flow are kept suspended in part by their own emissions of residual hot gas, but mostly from rising air entrained and heated at the front of the flow. When the supply of heat runs out, the particles settle onto the surface. 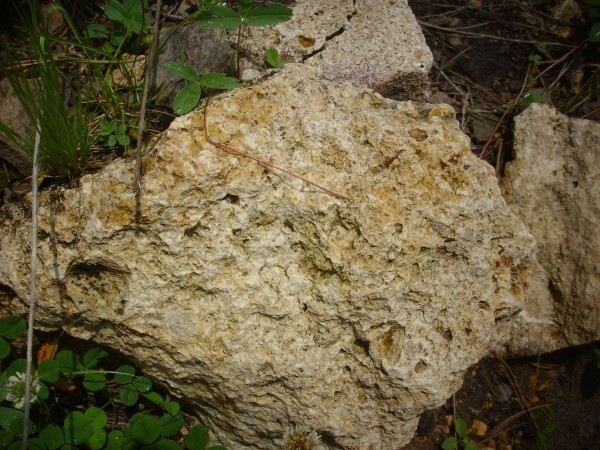 The resulting rock formation is called an ignimbrite, though earlier geologists described it as tuff, and the name continues to be widely used for this rock type. If the pyroclastic flow is hot enough, the clasts will still be slightly molten when they settle on the surface. The clasts will partially merge and there may be local flow, which will tend to smear out the larger clasts in the flow (often fragments of pumice) in a distinctive way (fiamme). Such an ignimbrite is known as a welded tuff. 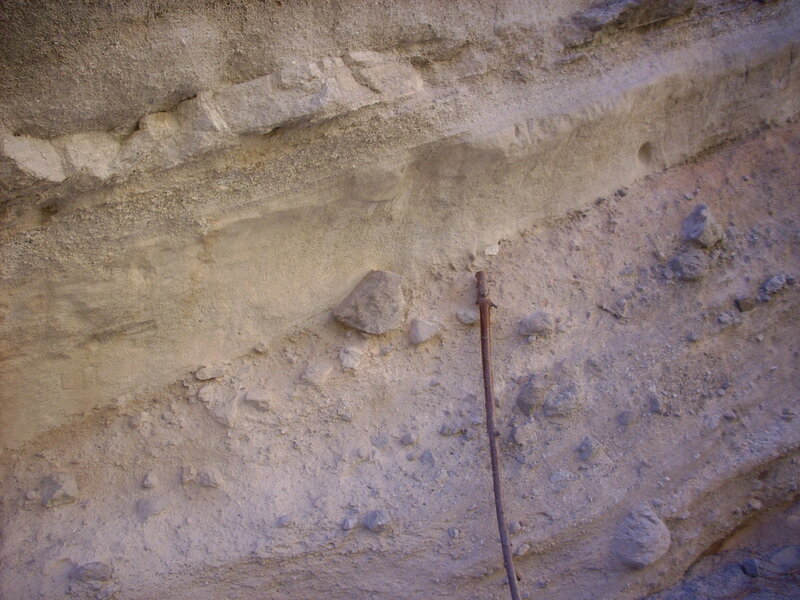 If the flow is not as hot, so that the clasts are fully solidified when the settle on the surface, they will retain their individual identity to produce an unwelded tuff. However, the hot gases trapped in the flow will cement the clasts together as they cool, so that an unwelded tuff is typically still solid rock, albeit a rock that is usually softer than a welded tuff. 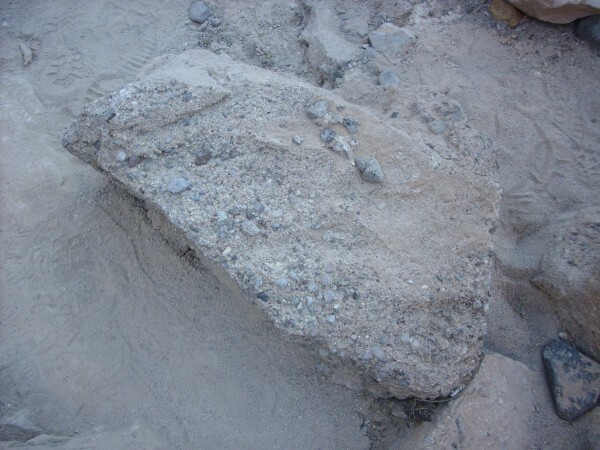 Further deposition of cement by ground water can further indurate either kind of tuff, so that hardness is not a reliable guide to whether a tuff is welded or not. The surer field criterion is that there are fiamme present in a welded tuff. Pyroclastic flows can reach speeds of over 300 km/h (200 miles per hour). Faster still are the hot pressure waves (blasts) that move ahead of them and to their sides, and which are one of the most serious hazards of volcanic eruptions. 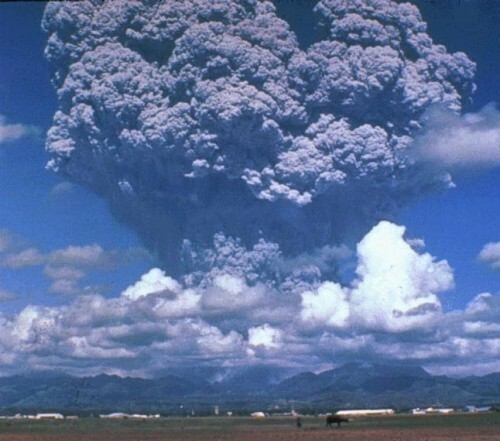 Behind the blasts are clouds of hot, turbulent gases with a relatively low ash content known as surges, which can produce characteristic surge deposits. We will see examples of all these kinds of pyroclastic flows in the pages that follow. Lahars are volcanic mud flows. They are formed when heavy rain mixes with fresh volcanic ash to form a dense mixture that can flow for miles down existing slopes and river channels, then harden like concrete when it comes to rest. We will have much more to say about lahars in the next chapter. Lahars are probably on the sedimentary side of the line between igneous and sedimentary rock types. Reworked tuffs are formed over longer periods of time when ash is exposed to wind and water, and they are definitely sedimentary rocks. 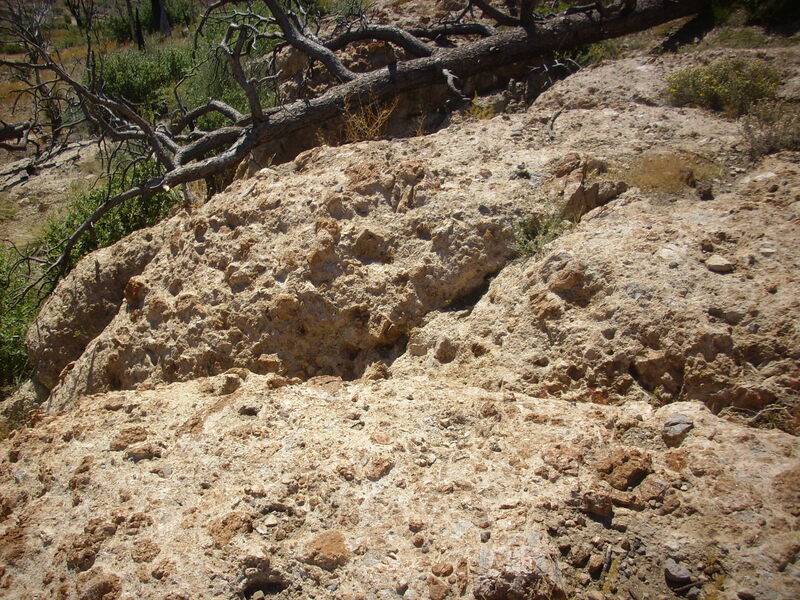 The Abiquiu Formation contains many beds of reworked tuff. The cementing of these rocks is brought about by the same processes of diagenesis that are at work in other kinds of sedimentary rock, though the abundance of silica in the ash aids the process and can produce very hard rock. A number of domes around the San Miguel Mountains are part of a formation called the Bearhead Rhyolite, named for its type location at Bearhead Peak. This formation is generally younger (6-7 million years old) and considerably richer in silica than the Paliza Canyon Formation. The Bearhead Rhyolite is found in the same general area as the Paliza Canyon Formation, with the Bearhead Rhyolite typically lying on top of the Paliza Canyon rocks. 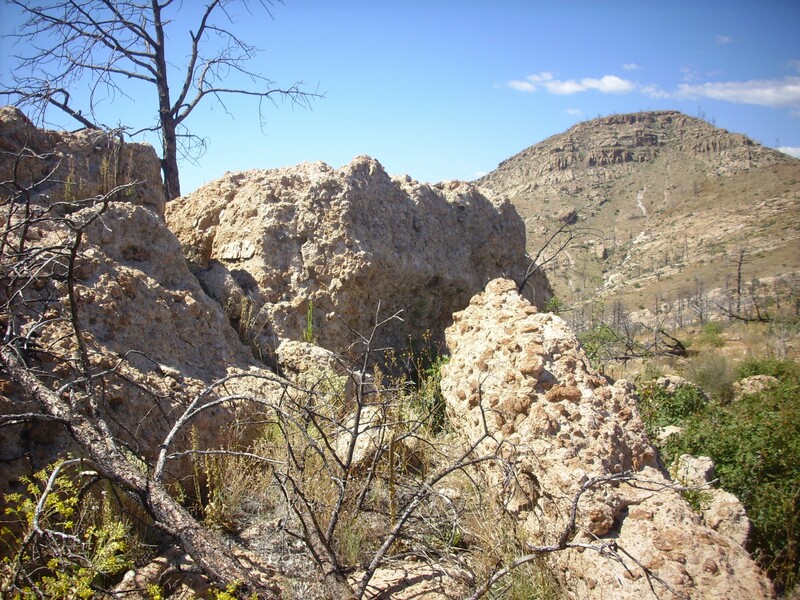 In some places, erosion has exposed lava vents in the Paliza Canyon Formation that are filled with Bearhead Rhyolite. One of the more accessible outcroppings of Bearhead Rhyolite is along Forest Road 298, well south of the side road to St. Peter's Dome. The road passes west of Cerro Balitas, a plug of Bearhead Rhyolite and tuffs that we saw earlier in our panorama of the area. The foreground ridge is underlain by Tshirege Member, Bandelier Tuff. The darker ridge behind it to the right is Paliza Canyon Formation andesite, while Cerro Balitas itself is Bearhead Rhyolite with a cap of Peralta Tuff. The road cuts through an outcropping of Bearhead Rhyolite as it passes west of Cerro Balitas. The geologic map for this area maps this as hypabyssal rhyolite, which cooled just below the surface. Here is a photograph of a sample of Bearhead Rhyolite from the outcropping shown above. There are signs of flow banding, which shows that the magma was still slowly flowing up to the time it solidified. 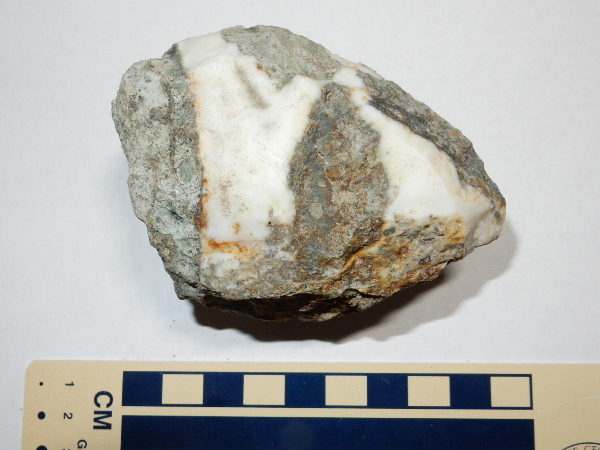 Under the loupe, the sample shows sparse phenocrysts of feldspar, quartz, and biotite mica. The ground mass is very fine grained, looking almost like a siltstone. 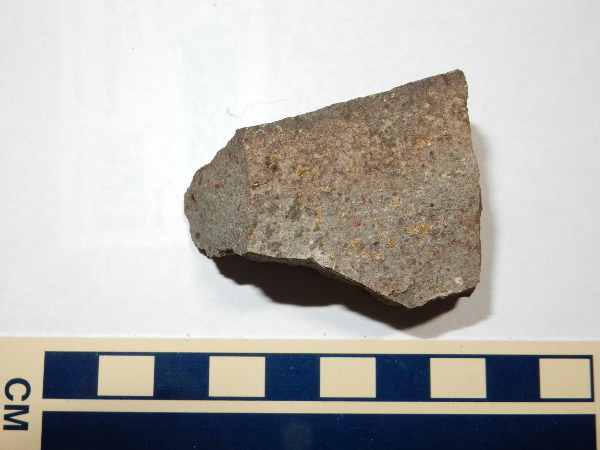 This is just within the Valles Preserve boundaries, so this sample was photographed in place. Another dike occurs along Forest Road 208 on Aspen Ridge. This exposure occurs along the Aspen Fault. 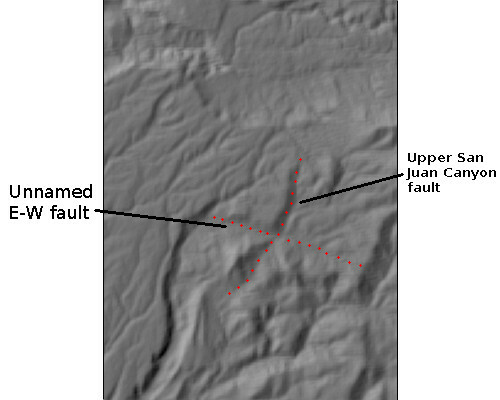 The exposure can be traced a considerable distance north along the fault. Many exposures of Bearhead Rhyolite in the southern Jemez appear to lie along faults of the Cochiti Fault Zone, which was active at the time the Bearhead Rhyolite was erupted. These faults gave the rhyolite magma an easy path to the surface. Here‘s an unusually well-exposed contact between a Bearhead Rhyolite dike and the surrounding Paliza Canyon dacite, on a spur of the eastern slope of Aspen Ridge. The light-colored Bearhead Rhyolite is visible in the foreground, with an abrupt transition to dark Paliza Canyon dacite futher from the camera. Bearhead Peak itself is one of the most inaccessible points in the southern Jemez, being surrounded by deep canyons and rugged terrain with no forest road nearby. However, one can get a distant view of Bearhead Peak from the Veterans' Memorial Overlook at Kashe-Katuwe National Monument. This is located on the south rim of Canada Canyon and overlooks spectacular scenery to the north, where several canyons converge in an area underlain by Peralta Tuff. The map of the Bearhead Rhyolite shows a rather interesting distribution. There are isolated large domes and plugs scattered throughout the Keres highlands of the southern Jemez, but the thinner dikes seem highly concentrated in a band that lies mostly along the east slopes of Aspen Ridge and in a part of the north caldera wall that seems to line up with this band. This may well be a fault zone that underwent rapid crustal extension 6 to 7 million years ago, providing numerous conduits for the underlying magma to reach the surface. It may be significant that the portion of the caldera overlying this band is known to geologists to be the area where the caldera floor dropped the greatest distance in the Valles eruption 1.25 million years ago. 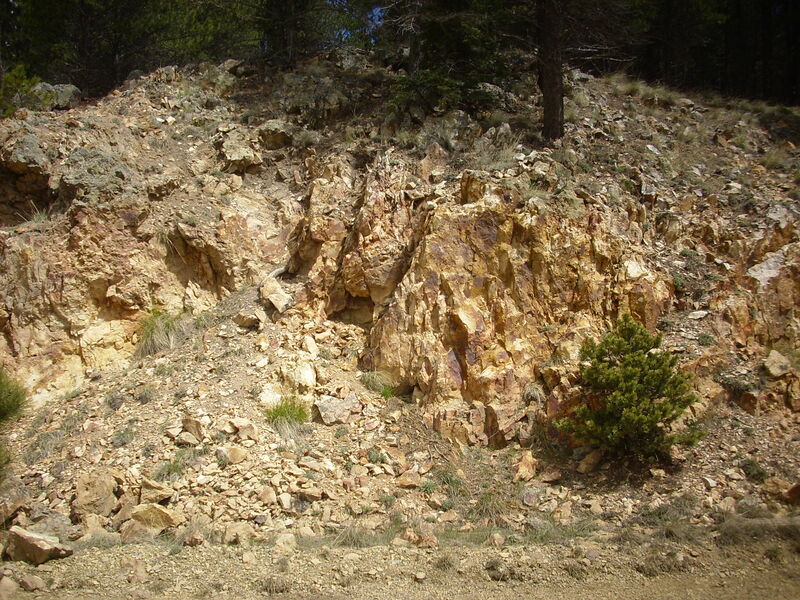 There are small outcrops of Bearhead Rhyolite throughout the eastern end of the northern moat area. Geologists interpret these dikes as feeder conduits connecting overlying domes and flows (now mostly eroded away) with a vast body of rhyolite underground, the Bearhead Batholith. It's conjectural that it's actually down there, but the conjecture is a good one. This outcrop marks part of the western margin of the zone of Bearhead Rhyolite intrusion. Additional thick dikes are found up slope, in the caldera rim to the north. Just a short distance along the road to the east is a sizable fault. The rocks immediately around the fault have been bleached white by hydrothermal fluids circulating through the fault. Here is the mass of white rock close to the fault. The fault trace is visible o the right of the outcrop. The rock here is Paliza Canyon Formation andesite that has also been hydrothermally altered. You can see that some patches of the rock are less thoroughly bleached. This fault aligns with the western edge of the Bearhead Rhyolite zone of intrusion. Further west, the caldera rim is unaltered andesite and dacite, until you reach older sedimentary beds at the base of the northwest canyon rim. Up slope of this fault are the westernmost intrusions of Bearhead Rhyolite in the north rim. 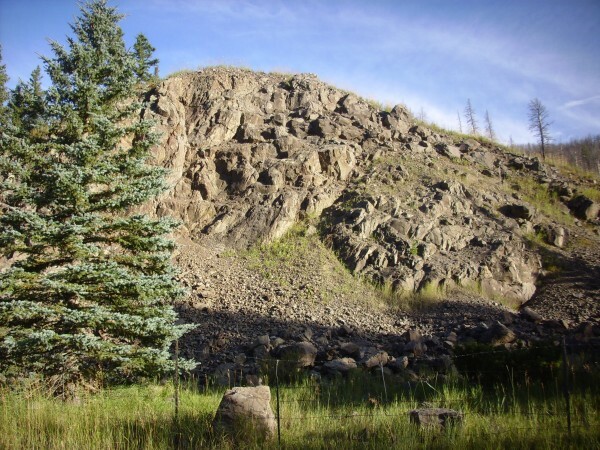 To the east of this point, there is additional faulting and numerous Bearhead Rhyolite intrusions until you reach the Toledo Embayment, a kind of semicircular divot cut out of the northeastern rim of the caldera. The Embayment is thought to have formed sometime after the Bearhead Rhyolite intrusions, and we'll look at it again later in the book. The intersection of the northeast caldera rim and the northwest rim of the Toledo Embayment form a reentrant in the caldera rim, a triangular point aimed into the caldera. At the tip of this reentrant is Cerro Trasquilar, a relatively young dome we'll examine later in the book. 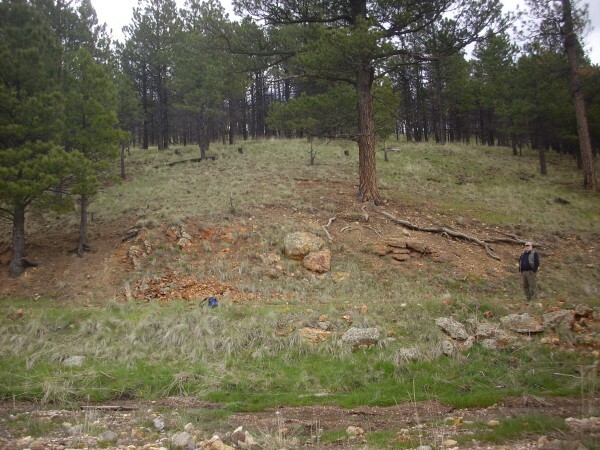 The remainder of the reentrant is underlain by highly altered rock that geologists believe was originally Santa Fe Group rift fill sediments from before the birth of the Jemez volcanic field. The Santa Fe Group beds are capped by flows of Paliza Canyon Formation andesite, themselves hydrothermally altered, and intruded by Bearhead Rhyolite. The older Bearhead Rhyolite intrusions have also been hydrothermally altered, while the younger and larger intrusions are pristine rhyolite. Here is a view of part of the reentrant from the northwest slopes of Cerro Trasquilar. At center is La Garita, the high point of the north caldera rim, which is underlain by Paliza Canyon Formation and La Grulla Plateau dacites. To the right are two hills, one in the foreground and the other in the middle distance. Both are mapped as Santa Fe Group sediments, intruded by Bearhead Rhyolite and interbedded with andesite of the Paliza Canyon Formation. The white outcrops on the nearer hill are part of a Bearhead Rhyolite intrusion. The Santa Fe Group normally consists of poorly-cemented dirty sediments. 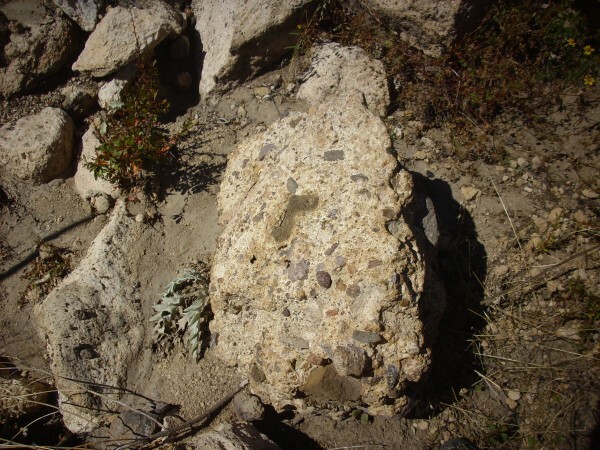 Throughout the reentrant, the sediments have been quite thoroughly baked and altered by the heat and acidic fluids given off by the Bearhead Rhyolite intrusions found throughout this area. 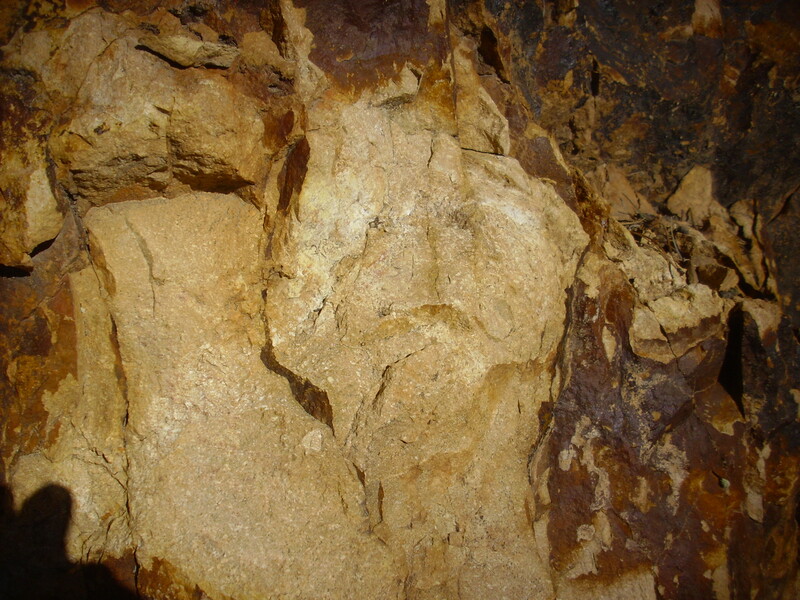 The loose sediments have been cemented into hard rock, with the orange color likely coming from oxidized iron. Other exposures more closely resemble well-cemented sedimentary rock. The cementing is quite thorough; this rock resembles a hornfels. 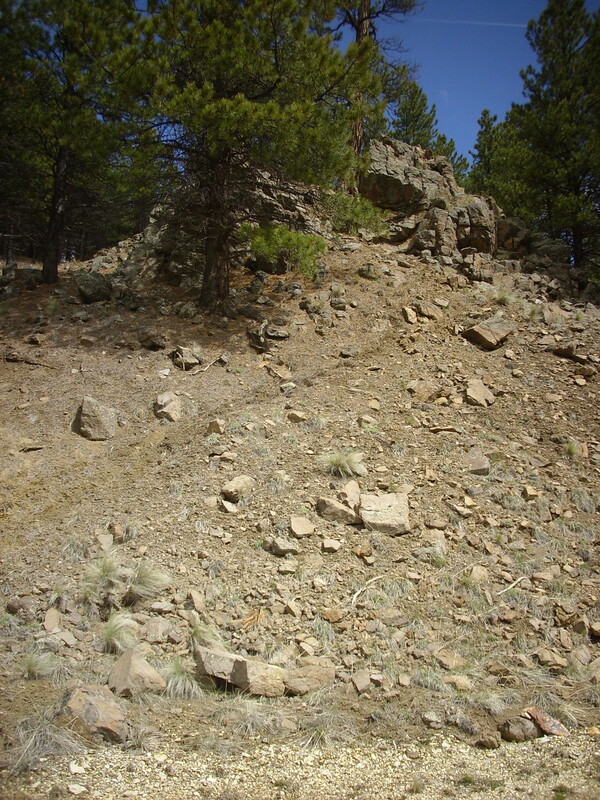 Up slope are pristine Bearhead Rhyolite intrusions. Higher up are more spectacular outcrops. Above the intrusion is an andesite flow. 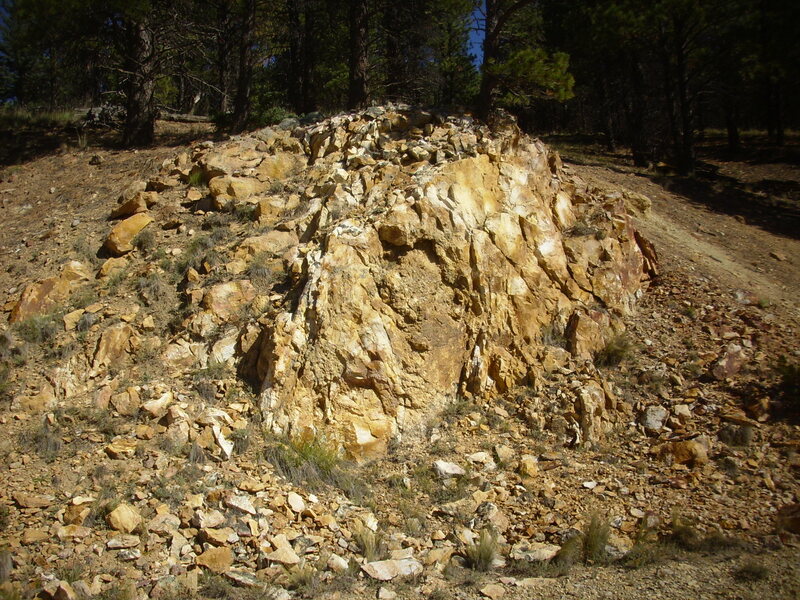 Like the Santa Fe Group sediments, this is heavily altered by the nearby Bearhead Rhyolite, but it’s clearly distinguishable from nearby Santa Fe Group hornfels. The overall picture geologists get is that mafic volcanism ceased in the Jemez around 7 million years ago, and did not resume again until about 4 million years ago. However, felsic volcanism continued for about another million years, and resumed earlier. 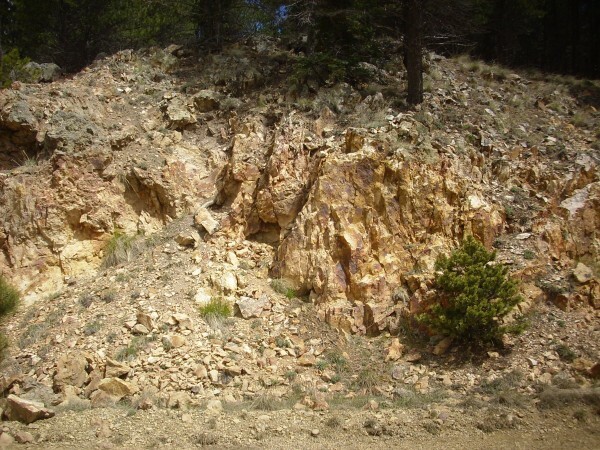 While the magma that produced Paliza Canyon Formation originated mostly in the mantle, the magma that produced the Bearhead Rhyolite was mostly melted crust. 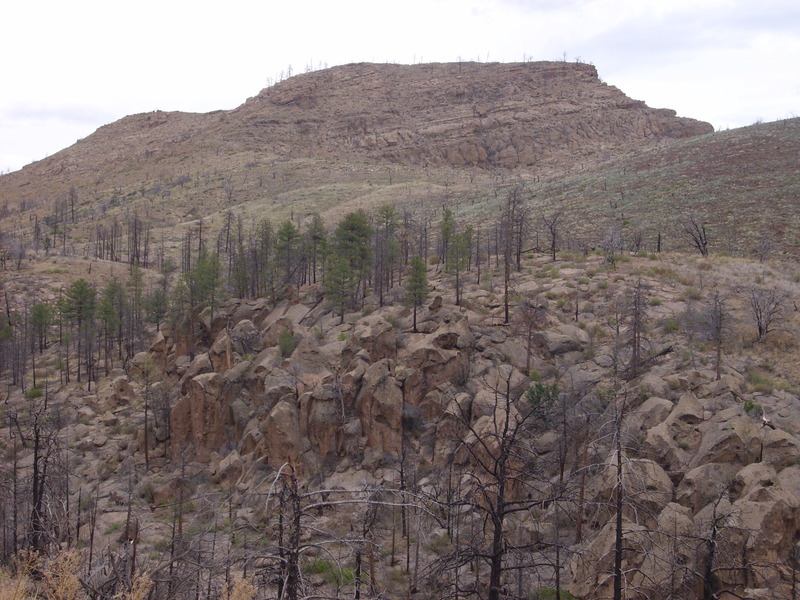 In an area like the Jemez, in which magma repeatedly rises from the depths, a considerable amount of high-silica magma can build up to form a giant magma chamber in the middle crust. We'll see the consequences later in this book. The Bearhead Rhyolite is not significantly different in composition from the Canovas Canyon Rhyolite that preceded it. It is more widespread, is centered further to the east, and is generally found overlying Paliza Canyon Formation flows. This may seem like a somewhat arbitrary distinction. However, it is common for otherwise similar formations to be separated by marker beds of distinctive character. The marker bed that distinguishes the older Canovas Canyon Rhyolite from the younger Bearhead Rhyolite is the Peralta Tuff Member of the Bearhead Rhyolite. The Peralta Tuff is thought to be about 6.8 million years old. It forms thick beds in some parts of the southeast Jemez, particularly around Kasha-Katuwe Tent Rocks National Monument. This is a relatively new national monument, established as almost one of the last acts of President Clinton in office. 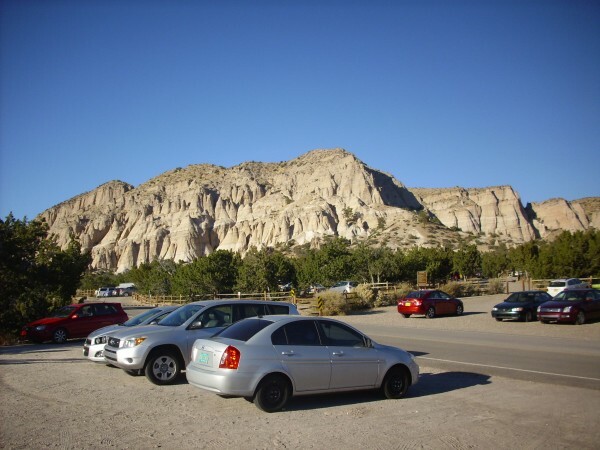 It is located in the southwest Jemez north of Cochiti Pueblo, and one must drive through the pueblo to reach it. The monument itself is on Bureau of Land Management land and is administered by BLM, a break with the usual rule for national parks and monuments. High-silica volcanism, such as that which produced the Bearhead Rhyolite, is violent. The magma is extremely viscous and tends to be saturated with dissolved gas, and this makes for explosive volcanism. 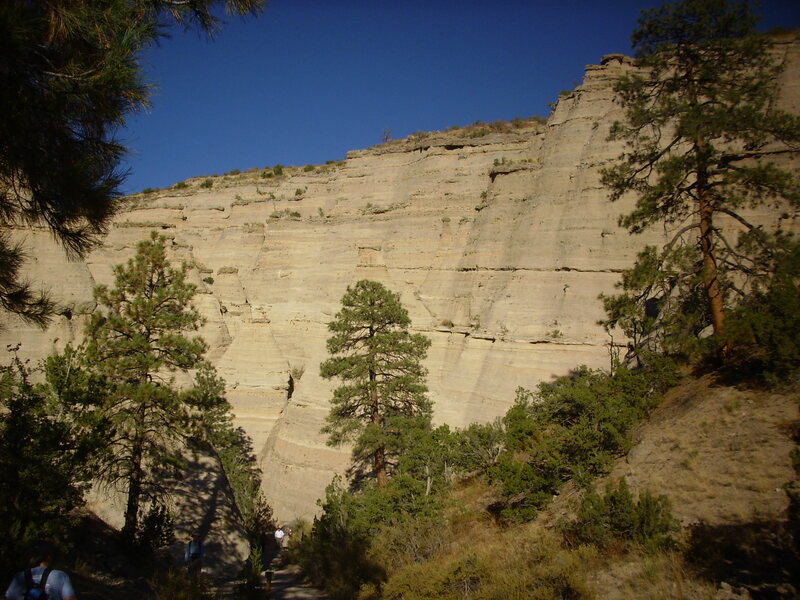 Such volcanism is responsible for the Valles caldera and the Bandelier Tuff that dominates the Los Alamos area. However, no caldera has been identified in the southern Jemez, and geologists speculate that the rapid widening of the Rio Grande Rift (which peaked in this area around 12 million years ago and was still quite active at 7 million years) tended to open fissures through which the magma was able to erupt before enough magma build up for a caldera eruption. The eruption was still violent enough to produce a great variety of pyroclastic rocks. 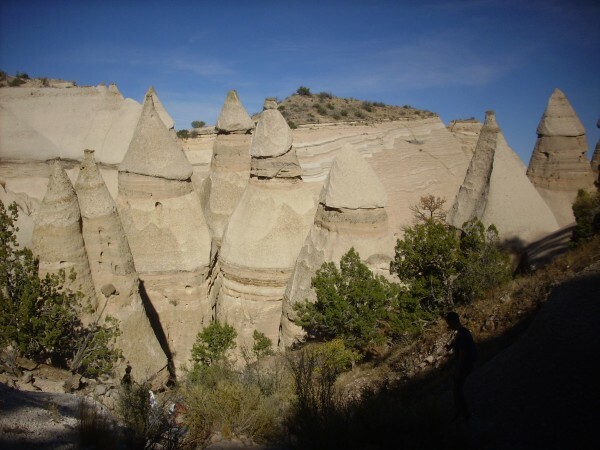 The area around Kasha-Katuwe Tent Rocks National Monument is underlain by two formations, the Peralta Tuff and the Cochiti Formation. The Peralta Tuff in this area records 35 separate explosive eruptions, of which 21 were ash and pumice falls from distant vents while 14 were close enough to deposit ignimbrites. Of these, at least seven originated from Bearhead Peak. The fall and flow deposits are interbedded with volcanic sediments reworked by floods and streams. 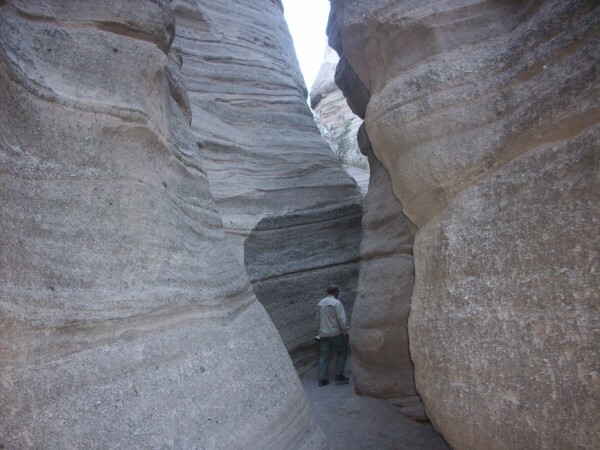 The distinctive feature of Kasha-Katuwe Tent Rocks is, unsurprisingly, the tent rocks. 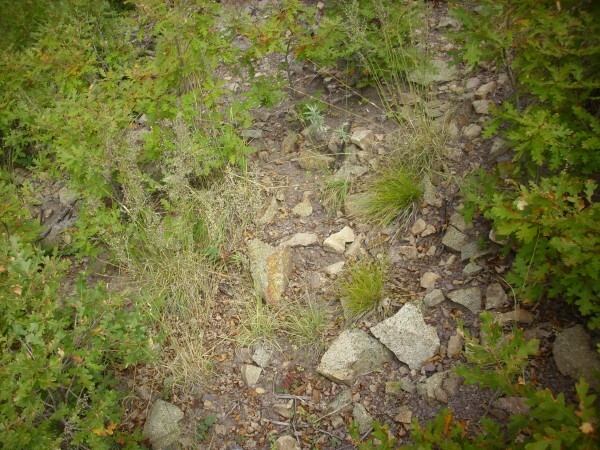 These form when relatively soft beds of ash are capped by somewhat harder beds that partially protect the beds underneath from erosion. The tent rocks are eroded out of the Peralta Tuff. 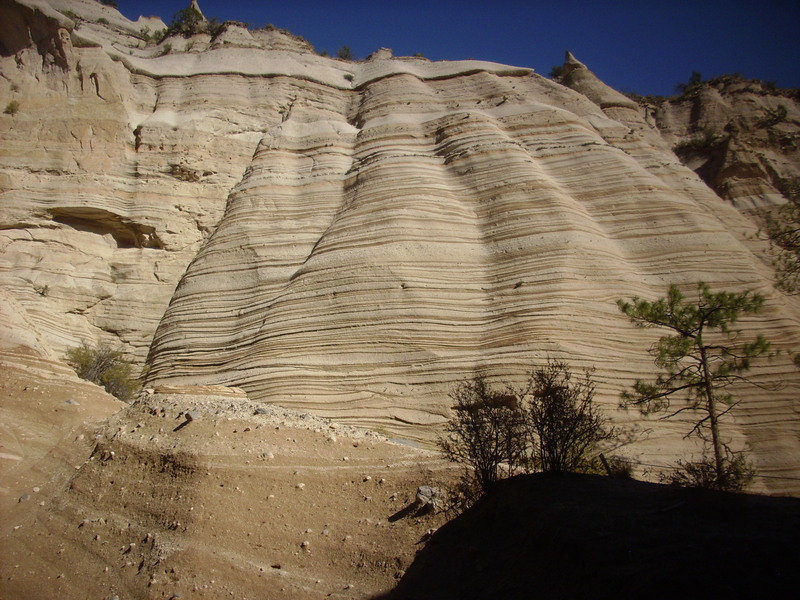 The Cochiti Formation forms the thin darker layer on top. 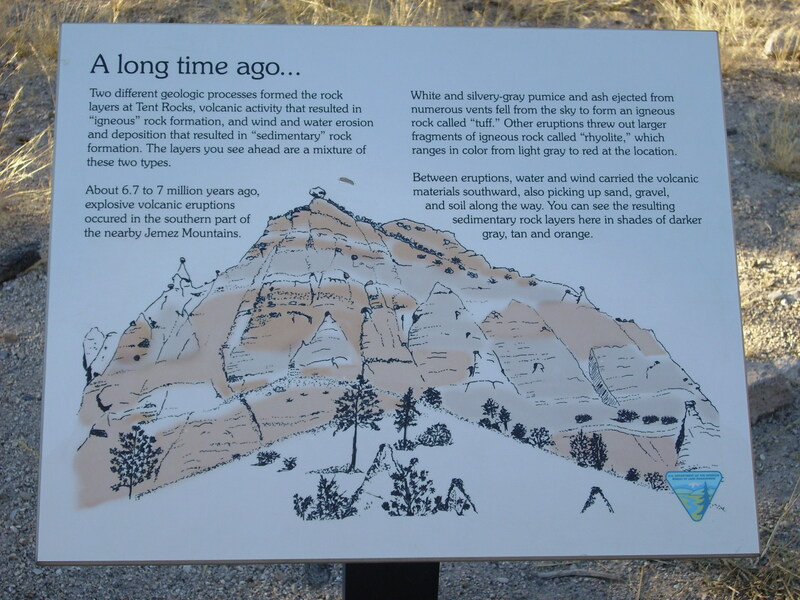 A local sign explains some of the geology. Click to enlarge. A spectacular feature of the monument is the slot canyon that has been eroded into the Peralta Tuff. The trail to the slot canyon first passes south of a magnificent exposure of the Peralta Tuff in a cliff side. Note the hoodoo atop the cliff, left of center, and the second hoodoo halfway down the cliff. (Click to enlarge.) 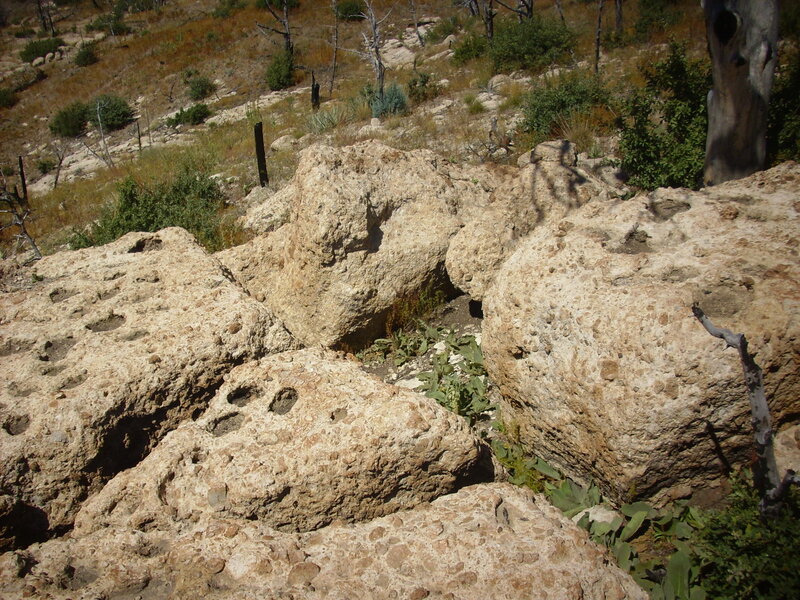 These form when a boulder protects the softer beds immediately underneath from erosion. The darker bands are reworked beds with considerable soil mixed in, while the purer white bands are individual pyroclastic flows or ash fall beds. 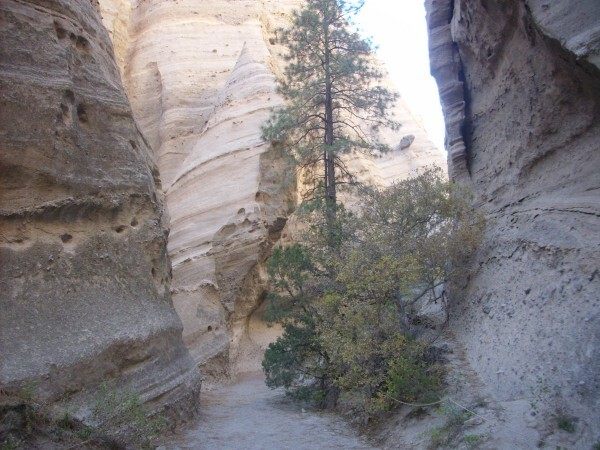 These beds are also exposed in the entrance to the slot canyon and throughout its length. This closeup shows the varying texture of the beds, which are sometimes very fine grained and sometimes contain quite large clasts. The walking stick for scale is about five feet tall. The bed towards the bottom with some very large bounders in it is probably a lahar. Lahars tend to be very poorly sorted. This large tree, known as "Eleanor" to the rangers assigned to the park, looks very much as if flash floods have eroded away several feet of soil from around the roots. 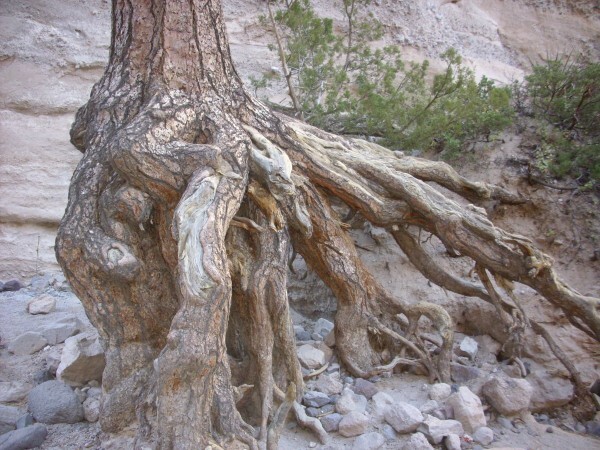 A ponderosa pine can live to be up to six hundred years old, and the tree was obviously already large when flash flooding washed the soiil from its roots. Erosion has therefore removed at least a foot every century. This is, in geological terms, a tremendously high rate of erosion, which cannot be sustained for long. The slot canyon has a magnificent, eerie beauty. Here there is a resistant layer that has eroded out of the softer beds above and below. My guess is that this layer is particularly rich in volcanic ash, which provides a source of silica for cementing the grains tightly together. Possibly this is a thin lahar flow between pumice falls. Note again my walking stick for scale. Here is a "mushroom" consisting of a resistant silica-rich bed above less resistant sediments. 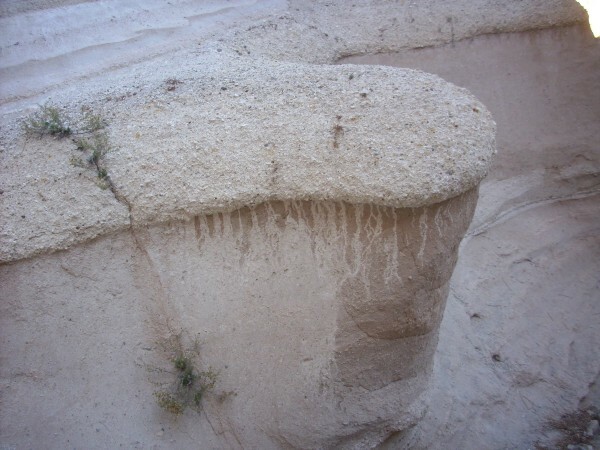 Much larger examples are found in the monument among the tent rocks, but it was interesting to see this one up close. At first glance, the "mushroom" looks like a pumice bed, but on close examination, one finds that the individual clasts are actually solid rhyolite. Some slabs of conglomerate on the canyon floor looked for all the world like concrete. Concrete is, after all, artificial conglomerate. 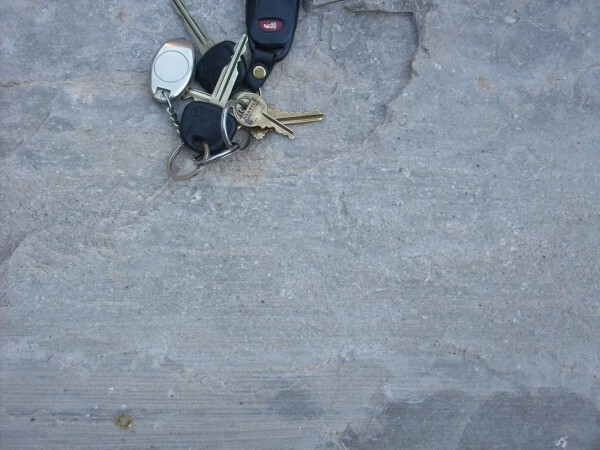 I have sometimes mistaken heavily weathered concrete for conglomerate in the field, and I doubt I'm the first geologist, amateur or professional, to have done so. Some slabs are so heavily opalized (cemented together with amorphous silica) that they are glossy in luster, and nearly as hard as quartzite. It's even possible that this is actually a solid block of flow banded rhyolite of the Bearhead Peak Formation that has been carried into the slot canyon by a flash flood. However, the visible grains and layering suggest opalized sediment beds. In the next photograph, recent heavy rainfall seems to have accentuated the beds. Notice that the beds at the very top cut across the beds beneath along a flat surface. 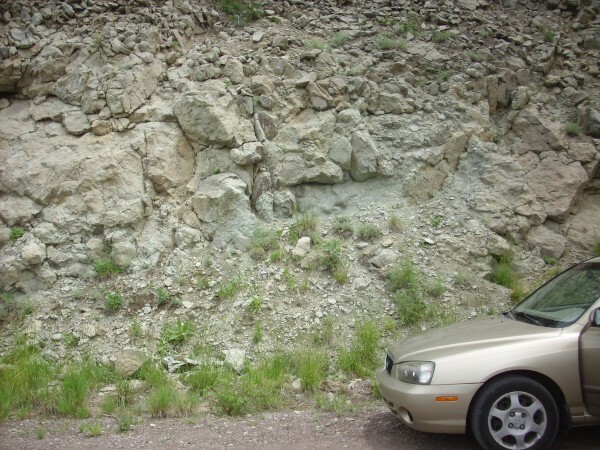 This angular unconformity suggests that something — perhaps an earthquake along a nearby fault — tilted the lower beds, which were then eroded flat, and new beds were subsequently laid down at a slight angle. The trail ascends the steep face of the canyon wall, giving a nice view back into a nest of tent rocks. Notice the thin rim of Cochiti Formation on the far canyon wall. The distinction from the underlying Peralta Tuff is clear. We'll revisit this shortly. The preservation of this much ash in this area is a consequence not only of its proximity to the vents at Bearhead Peak, but of its location between two major faults. 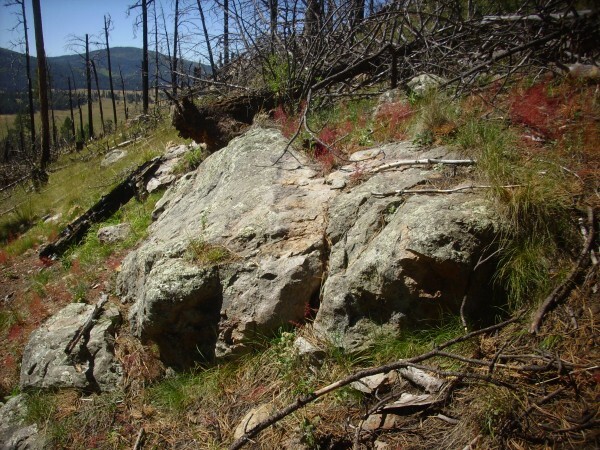 North of Kashe-Katuwe, the Pajarito Fault splits. 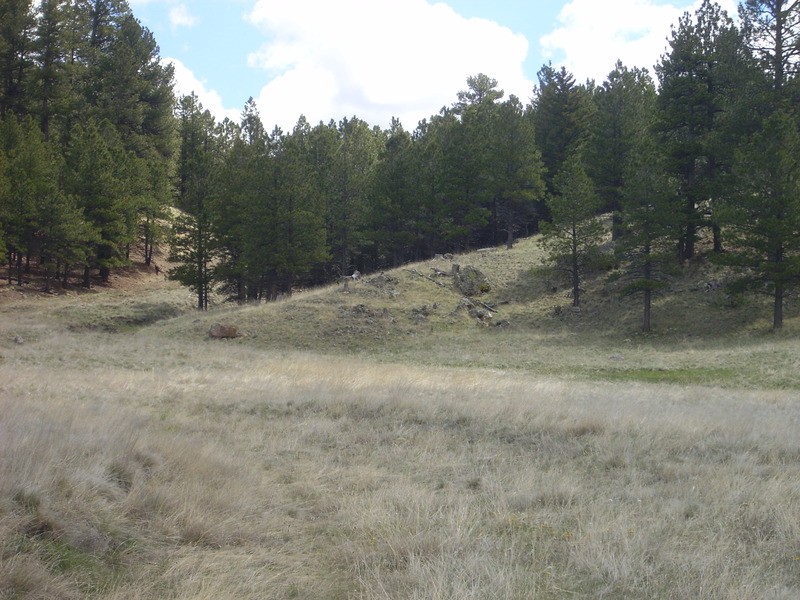 One strand contnues west of Kashe-Katuwe as a fault thrown down on the east side, like the Pajarito Fault to the north. The other stand passes east of Kashe-Katuwe as the La Bajada Fault, which is thrown down to the west. Kashe-Katuwe thus lies in an area that has dropped between two faults, forming a trap for ash and other sediments. I introduced Cerro Balitas earlier, since there is hypabyssal Bearhead Rhyolite exposed on its northwest flank. The rest of the hill is underlain by Peralta Tuff showing a variety of facies. The lower slopes of the hill on its northern flank are underlain by Tsherige Member, Bandelier Tuff. This is exposed as solid bedrock at the bottom of the numerous gulleys which, together with the heavy and thorny scrub growth, make hiking around the hill somewhat challenging. The Tsherige Member forms the relatively level surface north of the hill, dissected here by the headwaters of a tributary of Sanchez Canyon. The southern Sierra de los Valles are the distant skyline at left. St. Peter's Dome appears as the flat topped mountain near the center of the panorama. Cerro Picacho is to its right. The flank of Cerro Balitas fills the right side of the panorama. Partway up the flank, the Peralta Tuff is exposed. It is rich in lithic clasts, mostly of mafic rocks of the Paliza Canyon Formation on which Cerro Balitas and its outlying flows sit. Northwest of Cerro Balitas one comes across a striking outcropping of tuff. 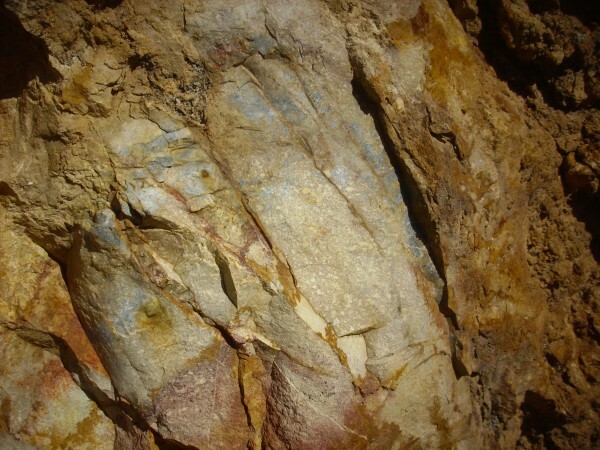 The two dark rocks at lower right are actually partially embedded in the white tuff beneath them. It is an indication how energetic the eruption was that it could sweep up such large blocks and carry them along. 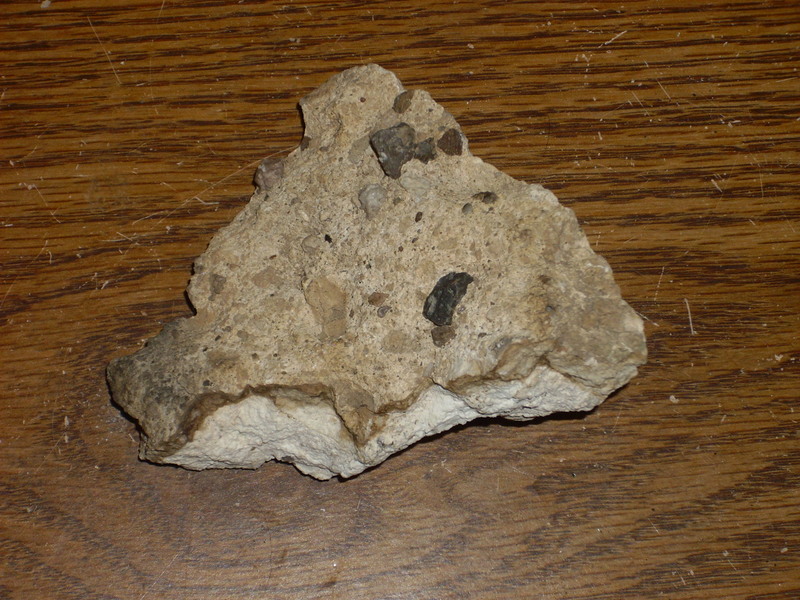 This lithic tuff resembles a conglomerate, but cemented by red-hot ash rather than minerals brought in by ground water. Looking back at the outcrop. There is a large flow of very lithic-rich tuff to the southeast of Cerro Balitas. Strictly speaking, to qualify as a lithic tuff, the tuff must have more volume of lithic fragments than of ash or phenocrysts. 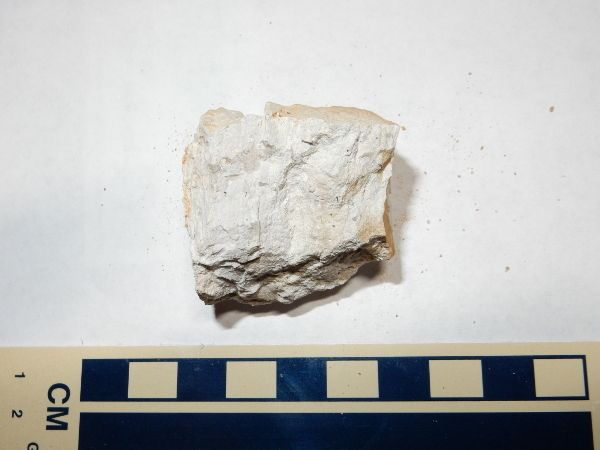 The earlier examples don't quite make it, but this exposure qualifies as a lithic tuff. Further down the flow, the nature of the tuff changes. 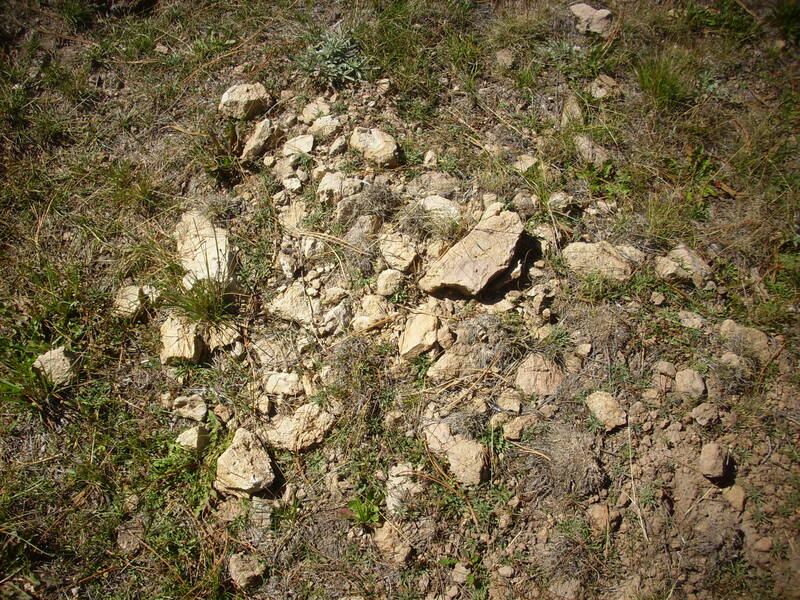 This is a lithic tuff, but the bits of rock appear to be composed of Bearhead Rhyolite, like the tuff itself, rather than Paliza Canyon Formation, as in the earlier examples. This is very likely an example of a block and ash flow, typically of high-silica volcanism. Magma this viscous tends to dome up rather than flow away from the vent. Such domes can become tens of meters high. When the face of a dome becomes steep enough, the solid outer crust can collapse, exposing the gas-rich liquid magma within. This explodes into red-hot volcanic ash, which mingles with the fragments of the solid outer crust to produce a flow like the one here. The mechanism is a little like the famous eruption of Mt. St. Helens, but on a much smaller scale. Or you can think of the famous eruption of Mt. St. Helens as the Mother of All Block and Ash Flows. I'm easy. Here is a panorama of Cerro Balitas seen from the southeast. Notice that the thin tuff beds at the head of the small canyon dip fairly steeply to the southwest (left) but the beds beyond, on the far side of the canyon and in Cerro Balitas itself, are level. It's hard for me to imagine that there isn't a fault running down the canyon, but the only fault mapped in this area is just over the ridge on the far side of the canyon. Go figure. More block and ash flows. And one more. This doesn't really show any geology I haven't already photographed, but it is probably the most Ansel Adams moment from this expedition. Here is a view from beyond the end of the tuff flow. Note that the flow is fairly steep at its face, resembling a high-aspect flow. However, this steep face is more likely an erosional feature. While scrambling up the flow, I ran across some impressive surge deposits. 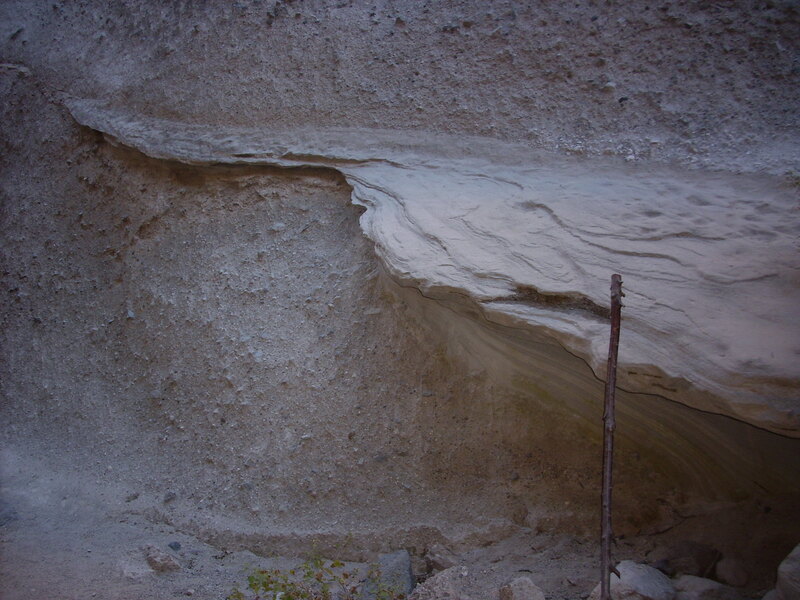 Surge deposits are common at the start or the end of a tuff eruption. Surge deposits differ from ordinary pyroclastic flows in that they are thinly bedded and well sorted, and likely formed from a mixture of gas and particles that was richer in gas. The particles are kept suspended by the turbulence in the flow more than by their own emission of gas. 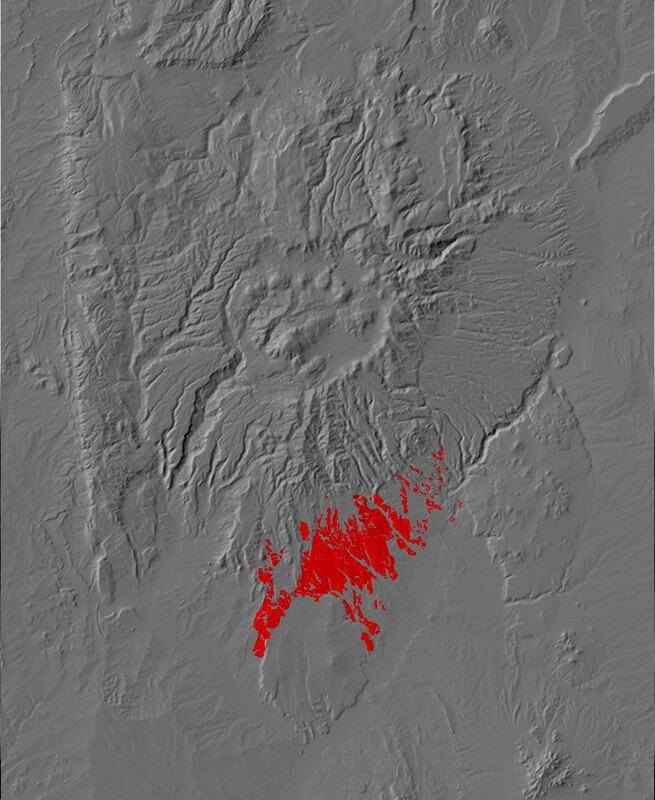 Such flows are relatively low in density and are more able to cross topographic barriers than ordinary pyroclastic flows. 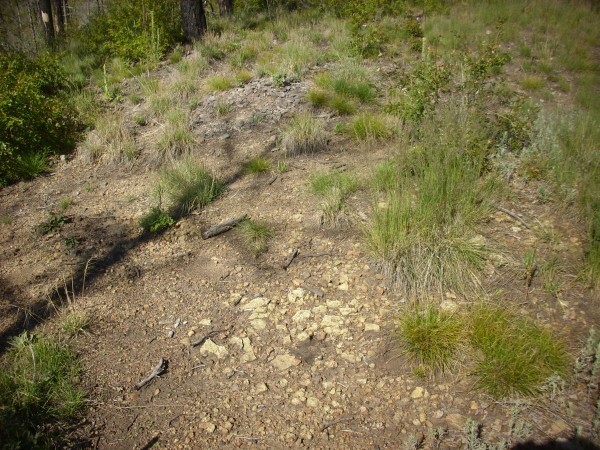 This deposit was located towards the top of the ridge. It is clear that the ridge was formed by multiple flows, and not a single eruptive episode. 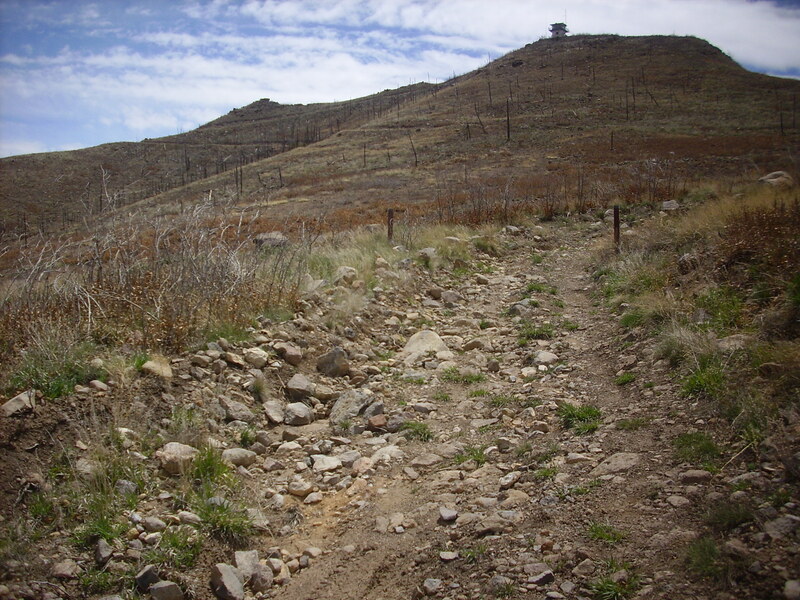 The upper slopes of Cerro Balitas are a difficult climb, but some boulders detached from the upper slopes are more accessible. These prove to be similar to the lithic tuff we've seen earlier. So Cerro Balitas is a knob of tuff surrounded by tuff, except for the outcrop of solid hypabyssal rhyolite around the northwest flank. 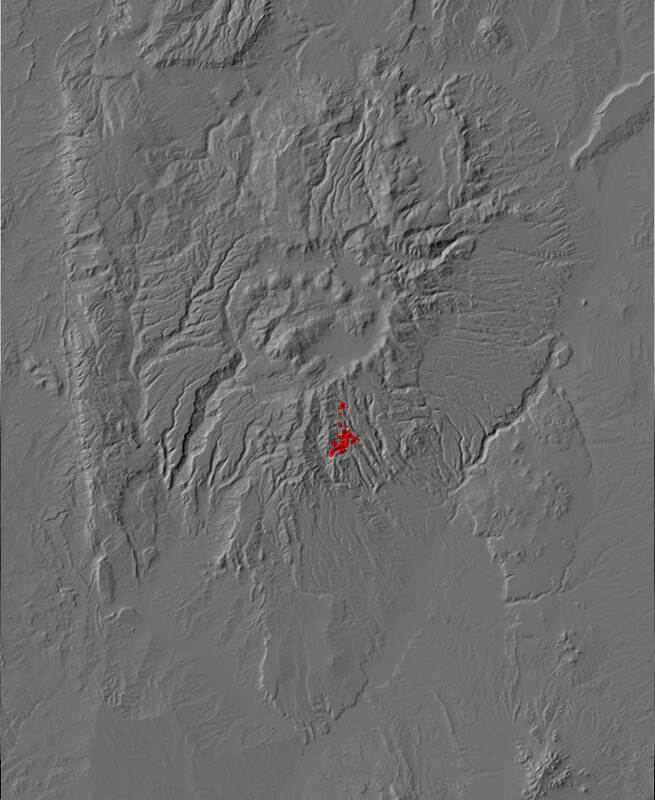 This may be the actual eruptive center, which has mostly eroded away, leaving Cerro Balitas as a remnant. There are two zones of prominent ash beds in the Chamita Formation of the Santa Fe Group. These can be quite accurately dated using radiometric methods. The lower zone is around 13 million years old and may correspond to early high-silica eruptions in the Jemez whose vents have since been buried by later flows. Some of the oldest Canovas Canyon Formation beds are close to this age. The upper zone has been quite precisely dated at 6.8 million years old, identical with the Peralta Tuff, and has the same composition. This is almost certainly ash fall from the Peralta Tuff eruptions. 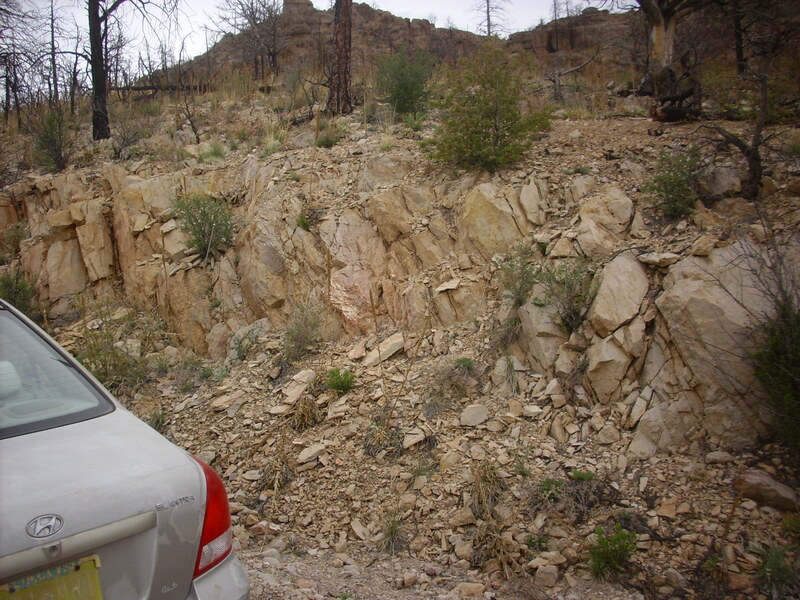 The CUTZ (geologists love acronyms, since they fit well on maps) is well exposed along Route 582 north of Pueblito. The whitish beds, best exposed at the base of the knob at right, are the CUTZ beds. They are located some 28 km (17 miles) north-northeast of the Peralta Tuff vents but are one to two meters (several feet) thick. Over geologic time scales, it is almost inevitable that groundwater will react with the rocks through which it passes, altering the chemistry of both. Where the water is cool and relatively pure and the flow rate is modest, such reactions will be slow, but when the water is hot, acidic, and constantly flowing, the reactions will be relatively fast and dramatic. 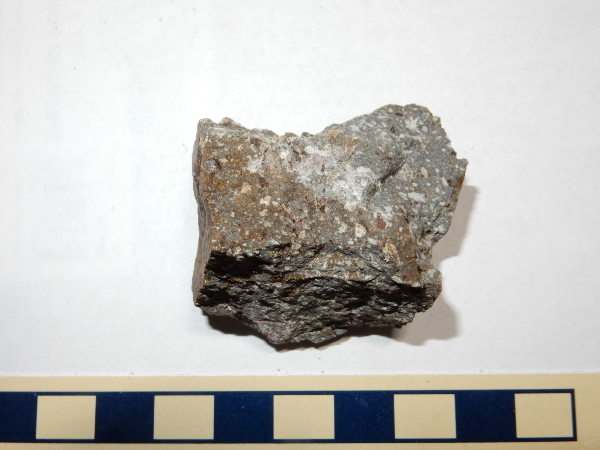 This results in hydrothermal alteration of the rock. Geologists recognize many forms of hydrothermal alteration, depending on the temperature and chemistry of the water. In many places, the Paliza Canyon Formation shows hydrothermal alteration. 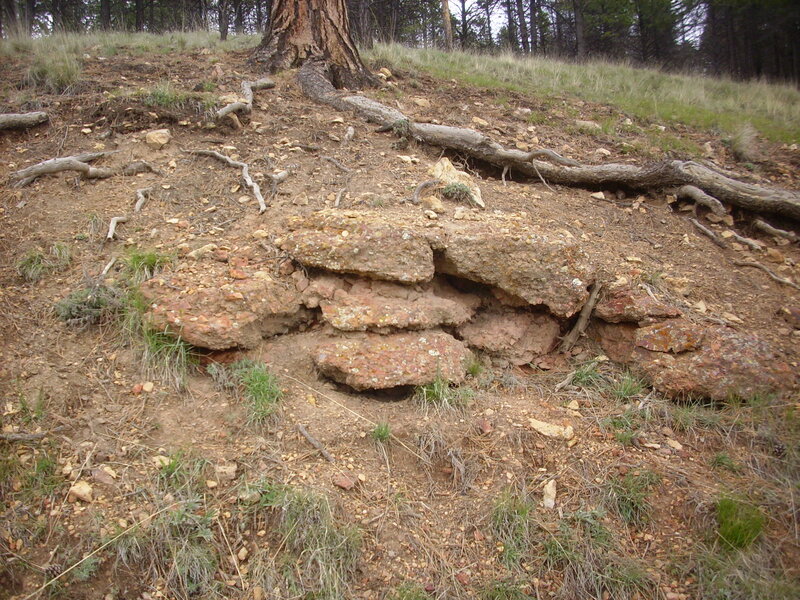 For example, here's an outcropping of Paliza Canyon Formation andesite at the base of the Valles caldera north rim. We examined this area in the last chapter. At first glance, this looks like another local outcrop of the Bearhead Rhyolite. However, closer examination reveals that it was probably originally andesite. The rock has been altered by hydrothermal processes. 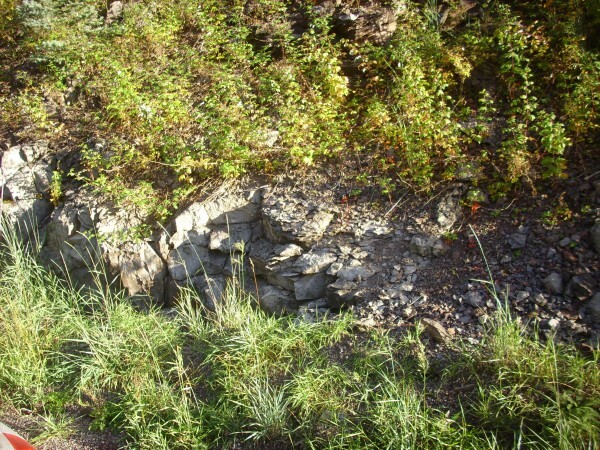 A few feet further along the road, we see some andesite that escaped alteration that shows the contrast. 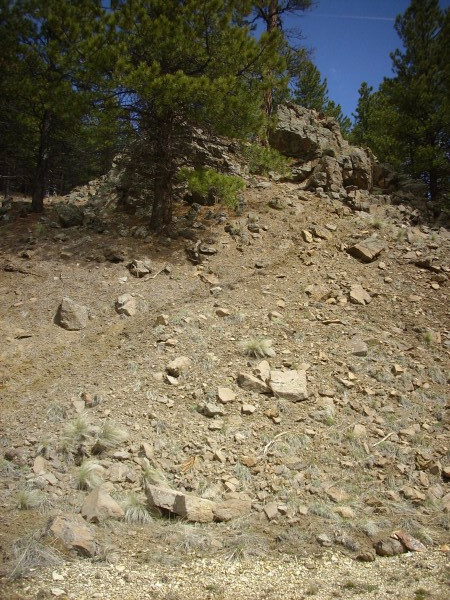 The dark rock at the top is unaltered andesite, while chunks of altered andesite litter the slope under it. The local nature of the alteration suggests that there was a small fault or other weakness in the rock under the altered andesite that allowed hydrothermal fluids from the underlying batholith to move upwards. It is no coincidence that Bearhead Rhyolite intrusions are found in the same part of the caldera north rim as hydrothermally altered rocks. This is an area where part of the Bearhead Rhyolite Batholith is close to the surface. During crystallization of a batholith, a great deal of volatiles (water vapor with many different dissolved gases, including acid sulfur oxides) is "sweated" by the solidifying mass of rock. This can do weird and wonderful things to the overlying rock. In the case of the rocks found here, the hydrothermal fluids were both hot and highly acidic, and their effect was to leach sodium and potassium out of the rock. Ferrous iron was oxidized as well, producing the reddish staining. A little further to the east is another example of hydrothermally altered rocks. Part of the outcropping is a coarse conglomerate containing angular fragments that cannot have come far from their source. These are embedded in a matrix of equally granular sand grains that are cemented together with silica and hematite. (The hematite is responsible for the orange color.) These are likely rift fill sediments, which form thick beds east of this location and north of Cerro Trasquilar. These beds are assigned to the Santa Fe Group and are sediments that had already been deposited in the Rio Grande Rift before the Paliza Canyon Formation was erupted on top of them. Here the sediments have been hydrothermally altered and cemented by fluids from the Bearhead batholith. Next to the conglomerate is a knob of volcanic rock so altered that its original type is uncertain. It could be anything from Paliza Canyon andesite to a local intrusion of the Bearhead Rhyolite. 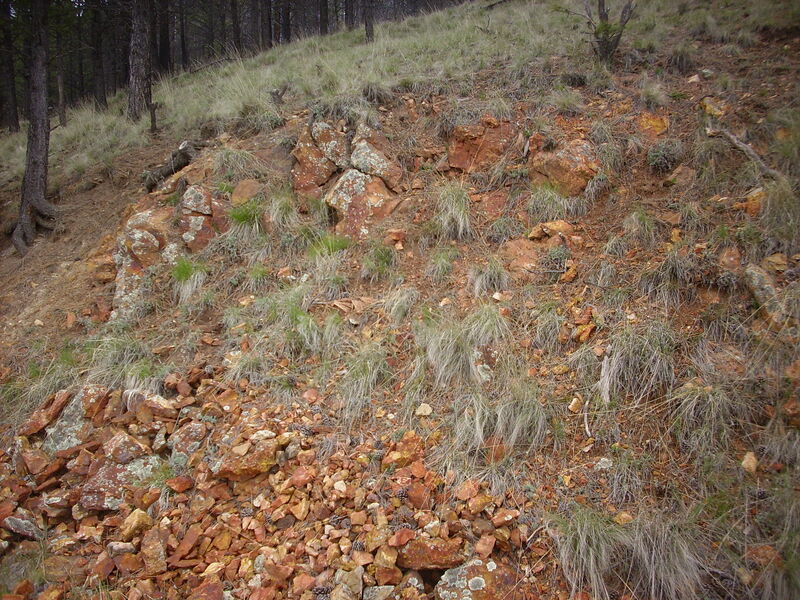 Another heavily altered outcrop is likely Bearhead Rhyolite. 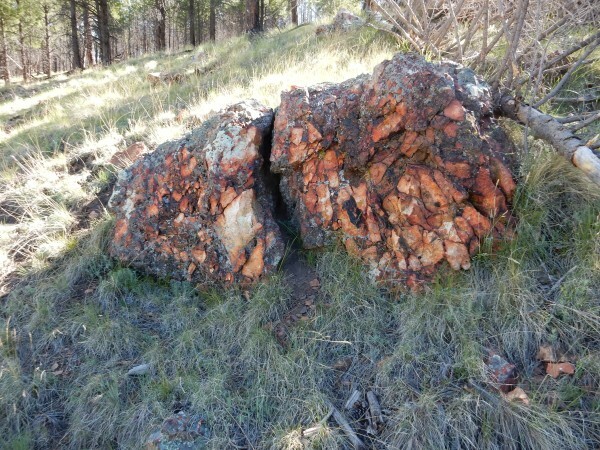 Or, at least, I think this is Bearhead Rhyolite. It can be hard to tell even rocks with very different origins apart in the field once they’ve been boiled in acid for a few thousand years. Hydrothermal alteration is pervasive in the Bland area, but extends north clear to the southern caldera wall. There are outcrops of altered dacite south of Rabbit Mountain along a southern spur of Forest Road 36. 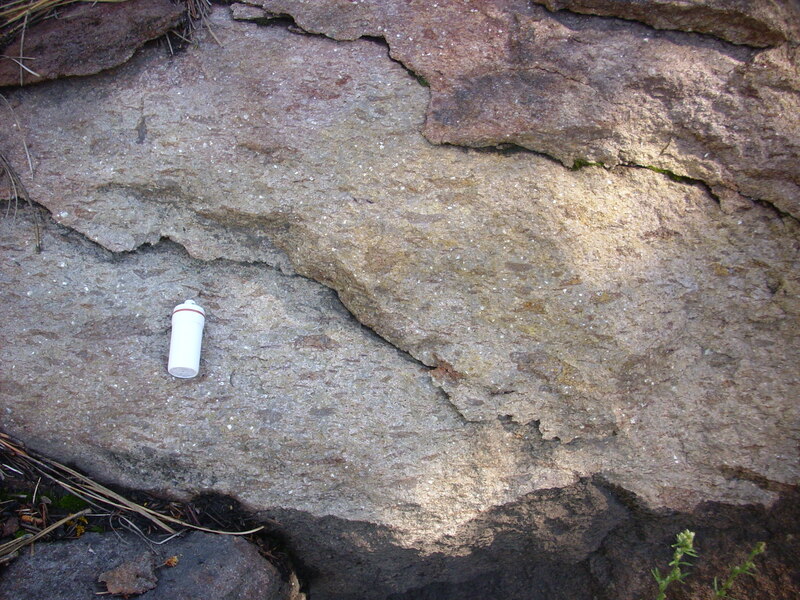 The white veins are massive quartz deposited in fractures in the rock. The rock itself shows signs of extensive oxidation of iron minerals, and there are scattered pockets of a translucent greenish mineral, which occasionally forms small tabular crystals. I'm not mineralogist to identify these with certainty, but their relatively high hardness suggests epidote, a common alteration product. 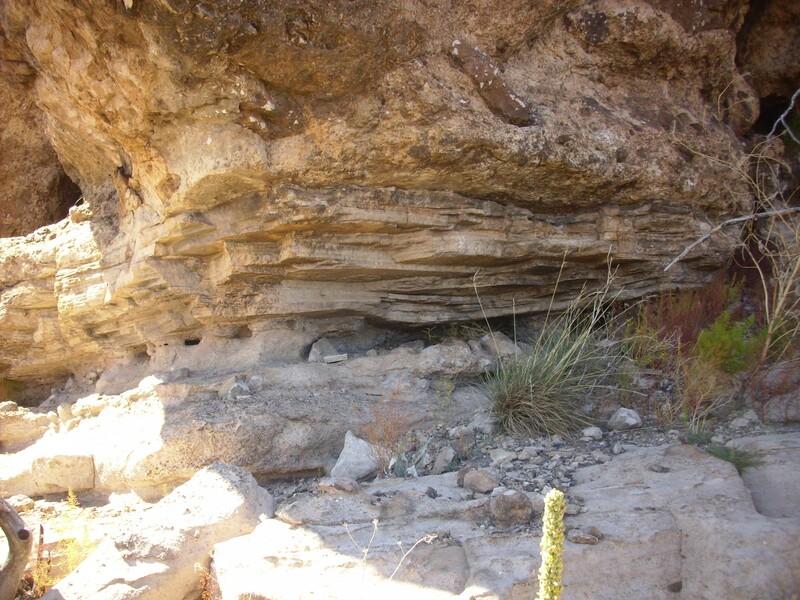 There is no question about the identity of the hydrothermal minerals at Las Conchas, immediately south of the highway, where Paliza Canyon Formation basalt has been hydrothermally altered. The unaltered basalt looks like this. This is basalt of the Paliza Canyon Formation, which has been dated to a hair over 8 million years in age. It is also the base of the south wall of the caldera in this location. 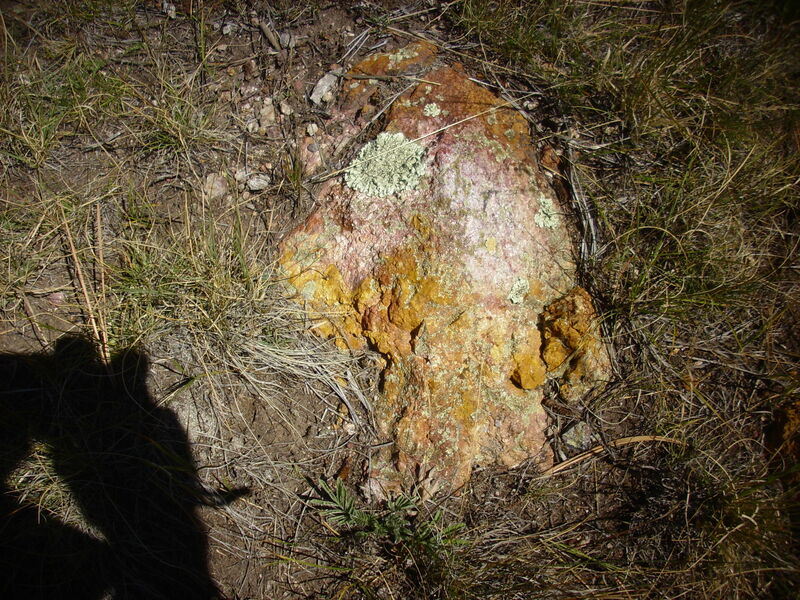 The outcrop in the photograph is not visibly altered, other than oxidization of scattered olivine crystals to rusty brown iddingsite. But just a short distance east, the basalt shows minerals deposited in cavities in the rock. 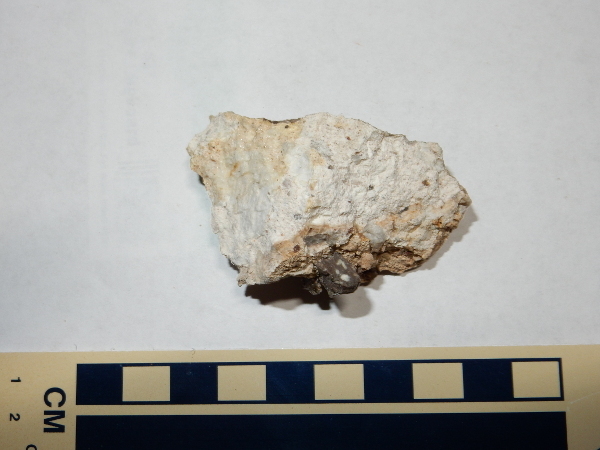 This sample appears to have had quartz deposited in it. Quartz alteration is not particular extreme. Somewhat more extreme is epidote alteration. The epidote is the green mineral appearing in patches and lining cavities in the basalt. It is a ferrous calcium aluminosilicate mineral, getting its green color from its iron content. 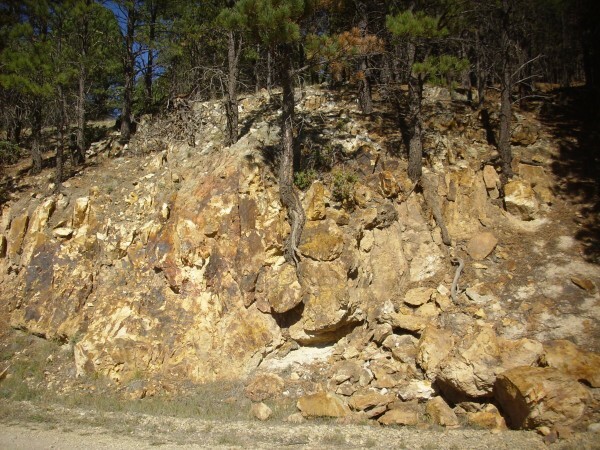 In 1889, gold was discovered in the southeastern Jemez. Disputes with Spanish land grant holders who claimed portions of the district were appealed all the way to the Supreme Court of the United States, which ruled that the land grant boundaries lay south of the district and the claims were on public lands. This triggered a gold rush and the establishment of mining camps at Bland and Albemarle. At its peak around the turn of the century, Bland was a mining town of 3,000 with a post office and over fifty other buildings. All this was crammed into narrow Bland Canyon. The ore was originally shipped to Pueblo, Colorado, for smelting, but by 1896 an amalgam mill (using mercury to extract the gold from the ore) was operating at the mouth of Bland Canyon. This was soon converted to the cyanide process. The richest of the claims, at Albermarle in nearby Colle Canyon, was accessed from Bland via a road called the Teamster's Nightmare, which climbed the 300m (1000') wall of Bland Canyon at better than a 30% grade.The first all-steel building in New Mexico was constructed in Colle Canyon to hold an automated gravity flow mill, and power was supplied from a plant constructed at Madrid, 56 km (35 miles) away, and a route for the transmission lines blasted up Colle Canyon. The ore took the form of quartz-pyrite veins associated with a monzonite intrusion that has become known as the Bland Stock. Monzonite is an intrusive volcanic rock consisting mostly of equal parts of alkaline feldspar and plagioclase. We saw examples earlier in the book, when we examined the large monzonite intrusions of the Cerrillos Hills southeast of the Jemez. 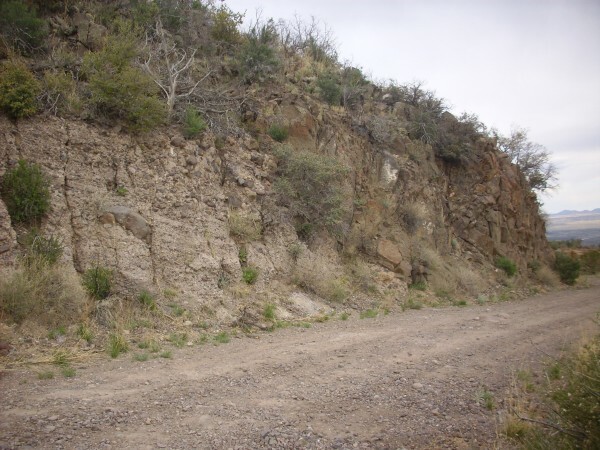 The Cerrillos Hills has been an important mining district since prehistoric times, and geologists originally assumed that the Bland Stock was of about the same age (30 million years old) and origin. However, the whole area is crossed by faults (which in turn host most of the quartz-pyrite veins) and most of the rock has undergone extensive hydrothermal alteration. This hampers efforts either to accurately date the rocks or to deduce their original character. The massive investment in the mines only recovered about 80% of its value. The confines of Colle Canyon trapped both dust from the mining operations and toxic cyanide fumes generated in the mill from the acidic ores. The cyanide problem was mitigated by neutralizing the acid with sodium carbonate, but the lack of a reliable water supply continued to hamper operations. Worse still, the best ore was found to be close to the surface, with the gold content dropping to half its surface value at a depth of 178m (585'). The ore was rapidly exhausted, and the Cochiti Gold Mining Company went bankrupt in 1902. The subsidiary Navajo Mining Company attempted to shift the focus of operations from Albemarle back to Bland, but itself went bankrupt within a year. The mining infrastructure, including the coal-fire power plant at Madrid, were sold at fire sale prices. Although low-level mining activity continued for many years, the post office finally closed in 1935, and the steel building housing the gravity mill in Colle Canyon was taken out for scrap during the steel shortage in World War II. 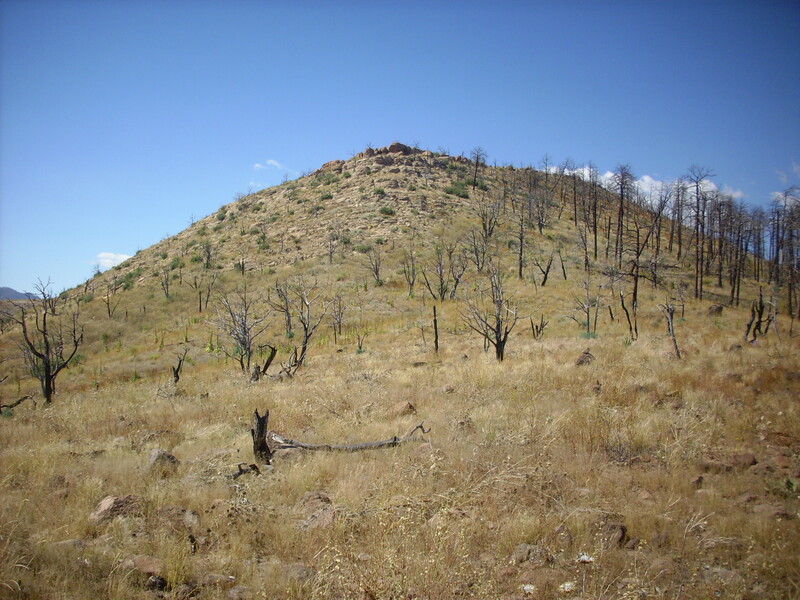 The last remains of the ghost town were destroyed in the Las Conchas Fire in 2011. The first radiometric dating of the Bland monzonite gave an age of around 11.5 million years, about the same as the older flows of the Paliza Canyon Formation. Geologists have since carefully traced rock beds from Bland to the north, where the hydrothermal alteration is much less extensive. The unaltered beds show characteristics typical of early Paliza Canyon flows, and the composition of the monzonite dikes intruding these beds is similar to Paliza Canyon rocks. Additional radiometric dates on Bland monzonites give ages around 6.6 million years, similar to the Bearhead Rhyolite, but this may reflect hydrothermal activity resetting the radiometric clocks. 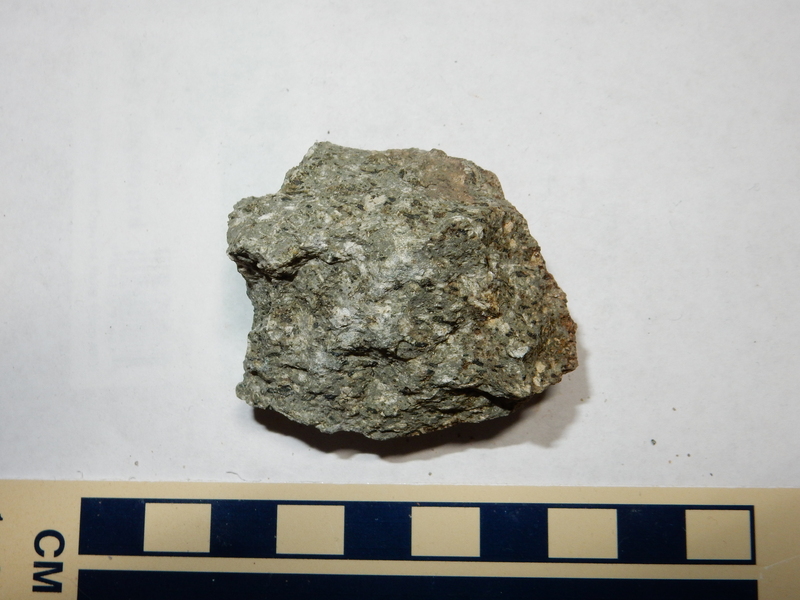 The current favored interpretation is that the Bland Monzonite is part of a solidified magma chamber that once erupted andesite and dacite of the Paliza Canyon Formation. As it solidified, the cooling magma "sweated" fluids rich in incompatible elements, including gold and silver. The subsequent Bearhead intrusion completed the alteration process and further concentrated incompatible elements to produced the quartz-pyrite veins that host the gold. Should the price of gold rise enough, the district could become economically viable again. As a result, much of the old mining district remains in private hands. The access roads are nearly impassible today because of flash floods that followed the 2011 fire. 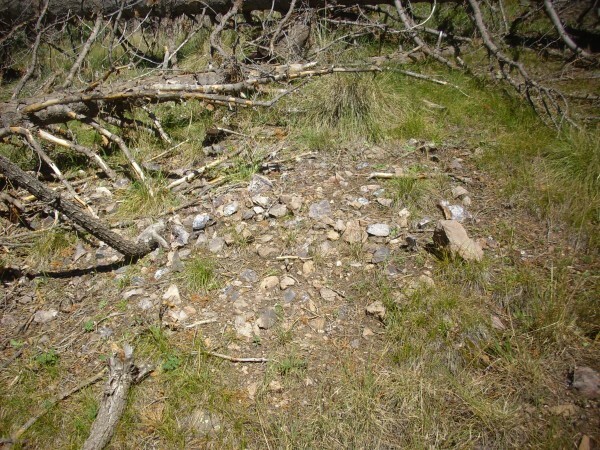 However, there are some poorly exposed monzonite dikes in a knoll east of Aspen Ridge that can be reached by bushwhacking about a mile from Forest Road 208 to the west. The best exposure is on the southwest flank of the knoll some distance below the top. 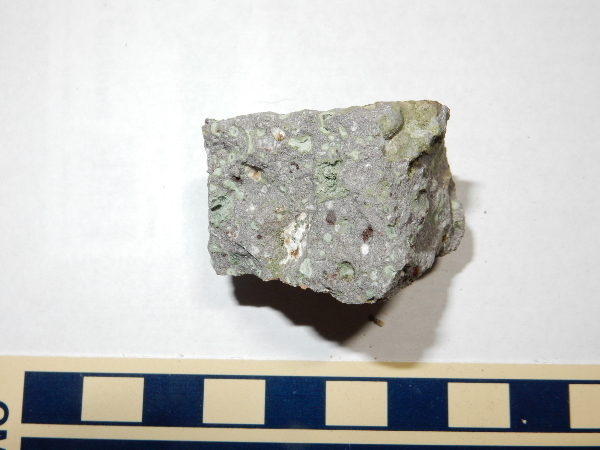 The greenish color is likely due to hydrothermal alteration to epidote. 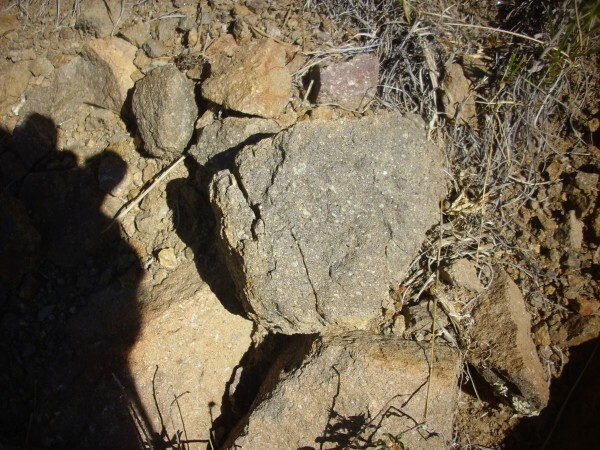 Additional monzonite dikes are found around the perimeter of the knoll, particularly on its east side and down into the adjoining canyon floor. 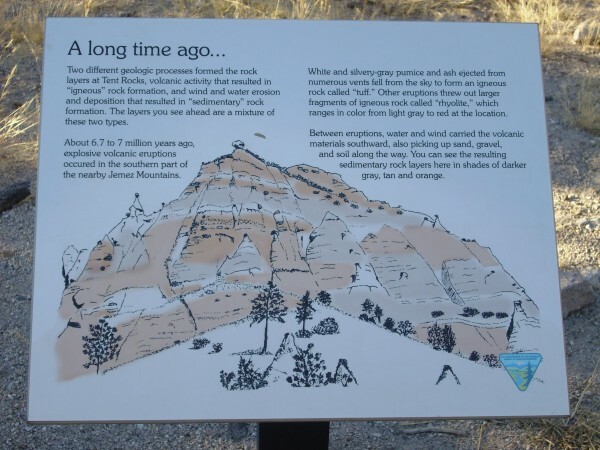 As the high-silica eruptions of the Bearhead Rhyolite began to die out, around 6 million years ago, erosion of the eruptive centers produced a large quantity of sediment that was deposited on top of the Peralta Tuff. This is the Cochiti Formation. It underlies a large area of the southeast Jemez, grading northward into the volcaniclastics of the Paliza Canyon Formation. 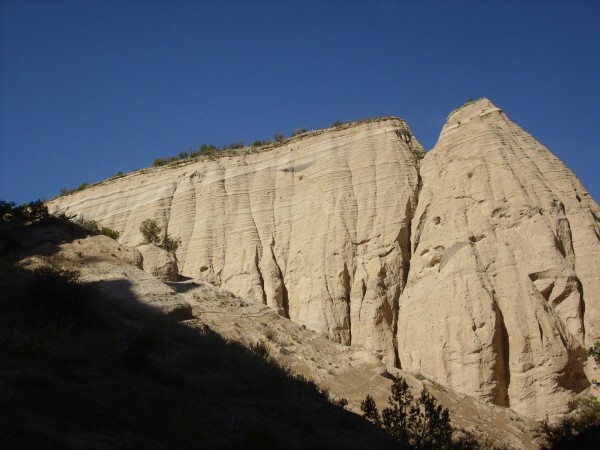 The distinction is that the volcaniclastics were formed at the same time as the Paliza Canyon Formation flows and domes and are rich in volcanic ash, while the Cochiti Formation formed by subsequent erosion and is poor in ash. However, the distinction is not a sharp one. This is reflected in geological maps of the Jemez, where a formation mapped as Cochiti Formation at the boundary of one quadrangle is sometimes mapped as volcaniclastics of the Paliza Canyon Formation in the neighboring quadrangle. In an attempt to make the distinction more rigorous, one geologist wrote an entire paper dedicated to examining different definitions of the Cochiti Formation. His precise definition is that the Cochiti Formation is sediments composted entirely of volcanic debris that overlie Keres Group beds and are in turn overlain by relatively young alluvial gravels. The Cochiti Formation caps the Peralta Tuff at Kasha-Katuwe Tent Rocks. The contact is particular clear just north of the main tent rocks as seen from the west. The contact between the Cochiti Formation and the underlying Peralta Tuff is obvious. 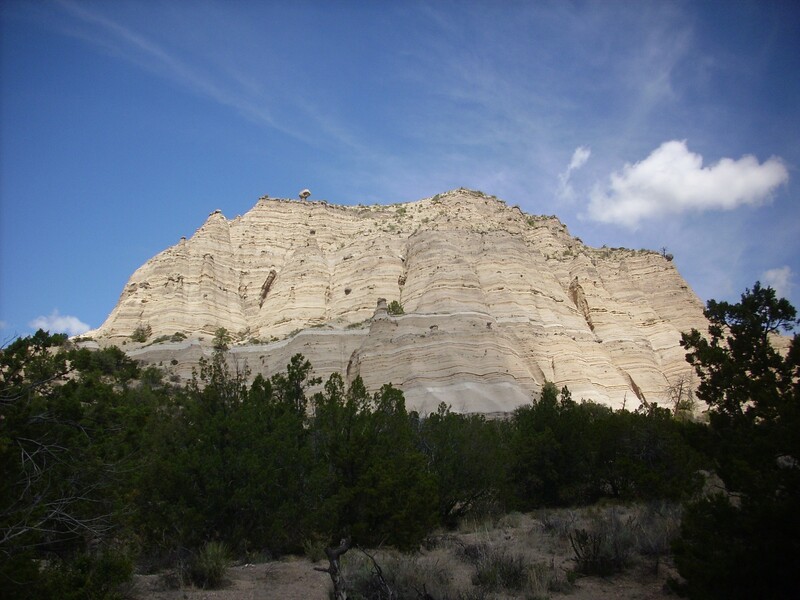 The less easily eroded Peralta Tuff is here a cliff-forming formation, while more easily eroded Cochiti Formation is a slope-forming formation that supports considerably more vegetation. Outcrops of the Cochiti Formation can be examined at close range at numerous locations along the road from Cochiti Pueblo to the Veterans' Memorial Overlook. Here is a particularly fine exposure. The lighting here makes the formation look almost handsome. The usual impression one gets in the field is of nondescript brown dirt. More formally, it is described as poorly-sorted silt, sand, and gravel of up to cobble size in a tan matrix. For comparison, here is a photograph of volcaniclastics of the Paliza Canyon Formation exposed further north, along Dome Road. The hill behind this road cut is the location of a source vent for the Paliza Canyon Formation. 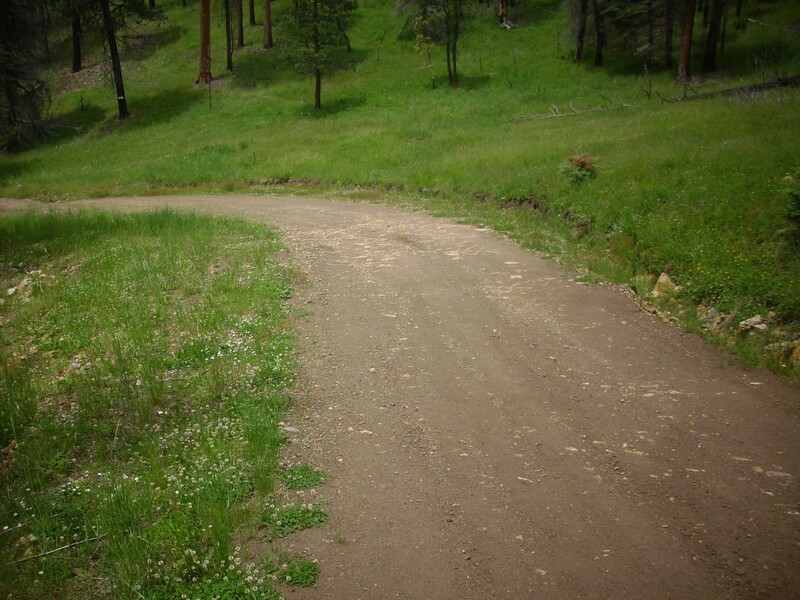 To the right in the road cut is solid porphyritic andesite. This has a radiometric age of 9.33 million years, making it one of older Paliza Canyon flows in this area. To the left are the volcaniclastics, assigned by some geologists to the Paliza Canyon Formation and by others to the Cochiti Formation. 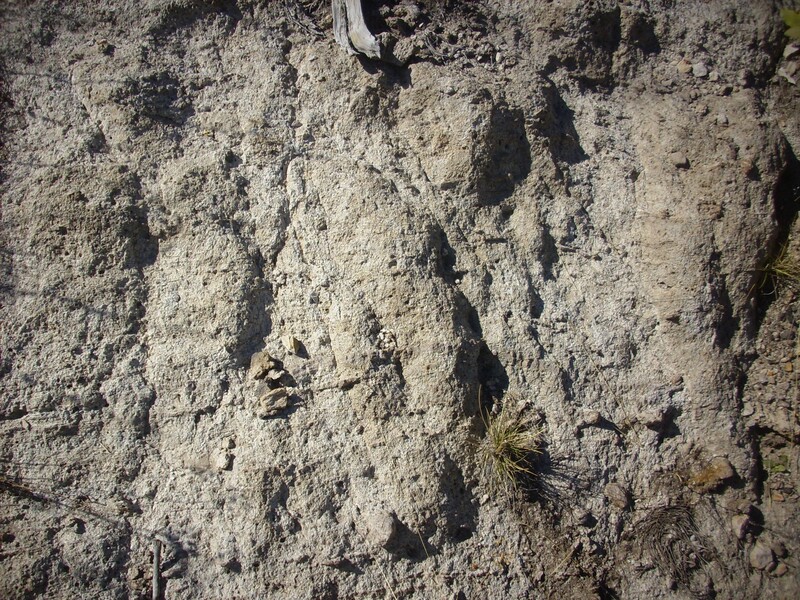 These deposits appear to be from an ash-rich mud flow, or lahar, formed shortly after the eruption of a Paliza Canyon Formation volcano. According to the recent rigorous redefinition of the Cochiti Formation, these would be assigned to the Paliza Canyon Formation. We'll revisit lahars again later in the book. What is the oldest mountain range in the world? Giving an answer is a bit problematic. Some mountains ranges in continental shields are composed of Archean rock over three billion years old. But the age of the rock is not necessarily the age of the mountain range itself. In New Mexico, the Precambrian cores of the principal mountain ranges are up to 1.8 billion years old, but these mountains are believed to have been thrown up during the Laramide orogeny, which began just 60 million years ago. 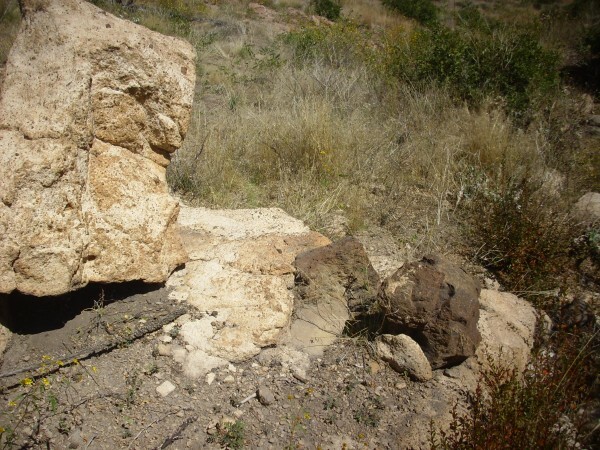 Erosion quickly attacks the mass of rocks thrown up by mountain building, and the Laramide mountains of New Mexico are in places deeply eroded, exposing rock which, based on the kinds of minerals it contains, must once have been many kilometers below the surface. Several kilometers of erosion in tens of millions of years is not at all unusual. Of course, the mountains themselves are not much more than a couple of kilometers higher than the surrounding terrain, and likely never were. As the tops of the mountains eroded, their deep, buoyant roots pushed the mountains back up to maintain isostatic balance. Because the difference in density between continental crust (2.7 g/cm3) and the underlying mantle (3.4 g/cm3) is not much more than 20%, it takes at least four kilometers of mountain roots to balance a kilometer of mountain. This means that for a mountain two kilometers high to be permanently eroded flat, some eight kilometers of rock must be eroded away. The granite cores of the Sierra Nacimiento at the western edge of the Jemez likely follow this pattern. There is some evidence this area has been thrown up repeatedly since the Mississippian, but the most recent period of uplift goes back at least thirty million years. This is enough time that the Sierra Nacimiento have been deeply eroded, as is clear when they are viewed from the west. Erosion has stripped the upper layers of this block of crust to expose Precambrian basement rocks that were once far below the surface. 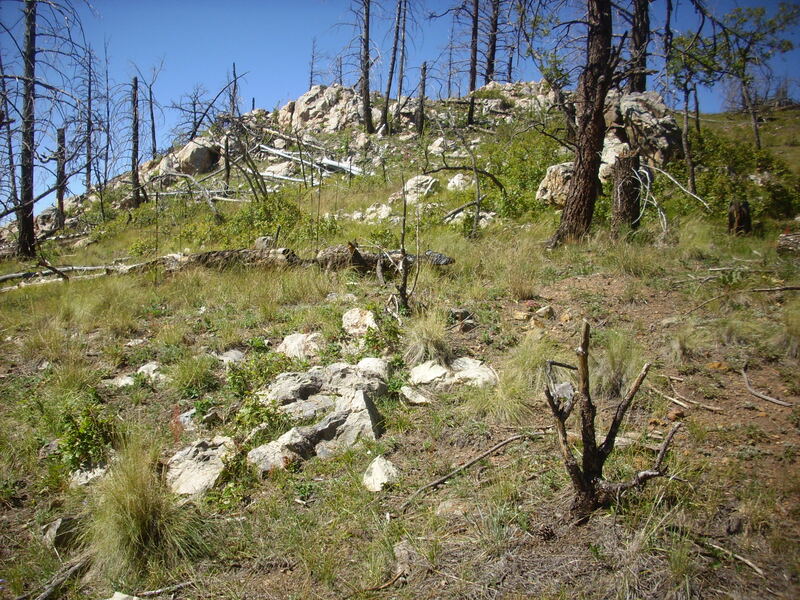 The high point in the southern part of the range, visible here, is Pajarito Peak, which is mostly underlain with gneiss with a quartz monzonite cap. These beds are around 1.6 billion years old. The range north of Pajarito Peak is underlain by the Joaquin Granite, with a radiometric age of 1.4 billion years. The volcanic rocks of the Jemez are particularly susceptible to erosion, since they include loosely consolidated volcaniclastic and ash beds as well as lava flows whose minerals are not entirely stable at the surface. When these flows were first erupted, they likely had the smooth surfaces that are still apparent on some of the younger domes of the volcanic field, which we will see more of in succeeding chapters. 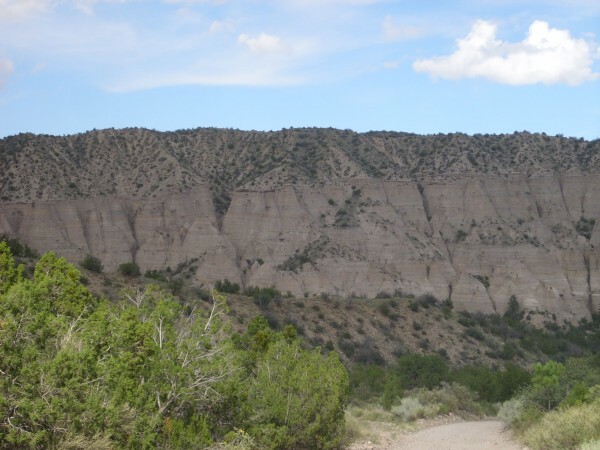 The older formations of the Polvadera and Keres Groups have been deeply eroded in the millions of years since they were erupted, preferentially along faults associated with the Rio Grande Rift. 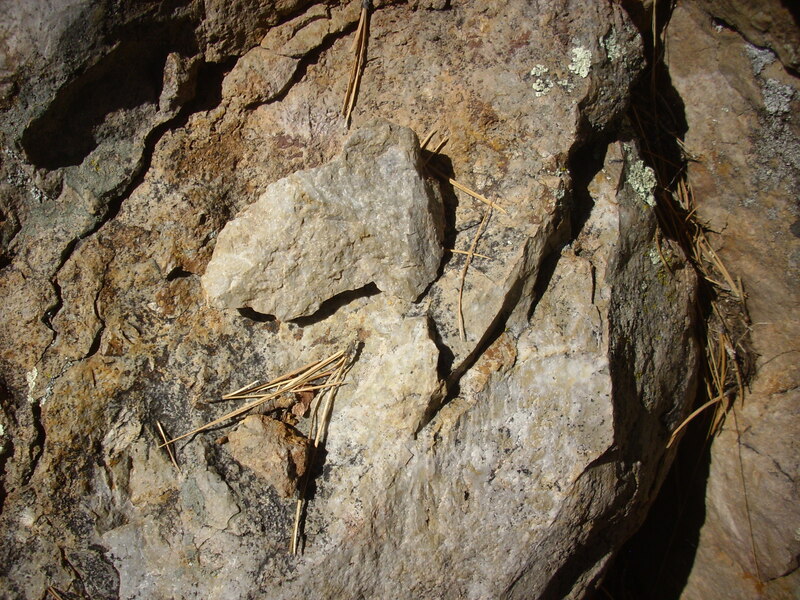 The fault zones break up the rock, making it more susceptible to erosion. A particular clear example is upper San Juan Canyon. The deep canyon in the lower left part of this relief map is lower San Juan Canyon. The upper part of the canyon turns sharply east to follow an unnamed east-west fault, then turns sharply north again to follow the Upper San Juan Canyon Fault. To the east, upper Paliza Canyon and upper Peralta Canyon also follow major north-south faults. 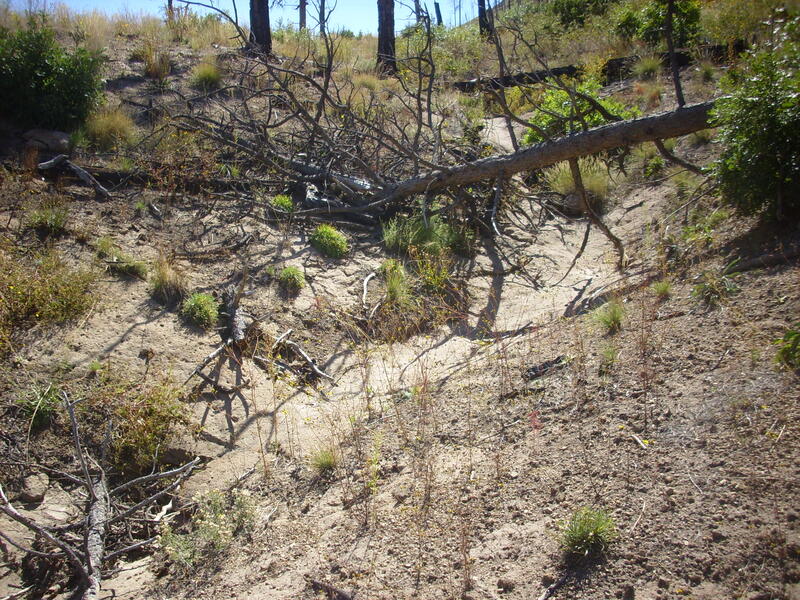 The rugged terrain of the southern Jemez suggest that erosion has been extensive, so that little of the original surface is left. Nevertheless, most geologists do not believe that the original terrain could have been much higher than the remaining ridge crests and peaks. 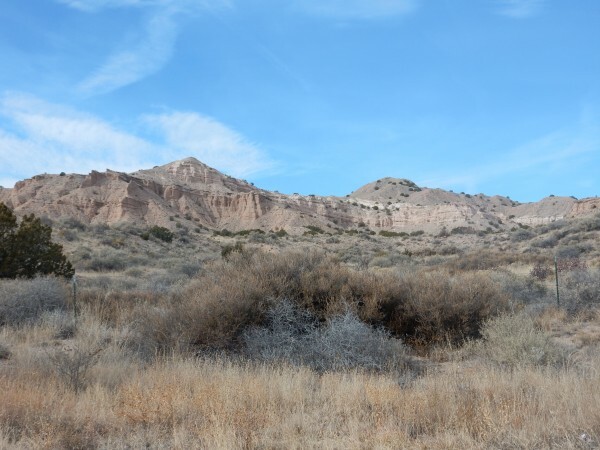 Local domes that obviously correspond to eruption centers, such as Cerro del Pino southeast of San Juan Canyon, are still discernible as high points of the terrain, though they have likely been stripped of their outer mantles. As we shall see in the next chapter, it seems to take about four million years for a fresh eruptive center to show obvious signs of erosion. Next page: Dacite and dacite, what is dacite? Copyright ©2015 Kent G. Budge. All rights reserved.